This year I was on the planning committee for the third annual Perth Amboy Waterfront Arts Festival. 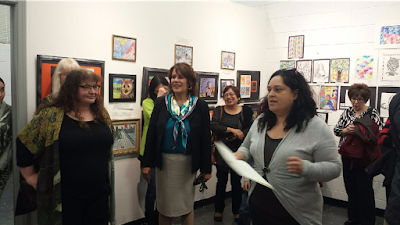 I also made a monetary donation that helped to pay for one of the bands. 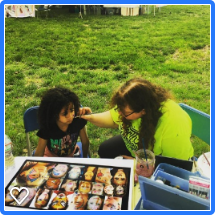 On the day of the festival, I worked for the Department of Recreation doing free face painting for the Perth Amboy community. Children used the poster I designed below to select their favorites. 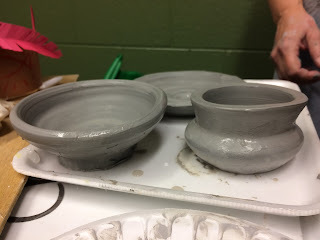 They were also able to make special requests. 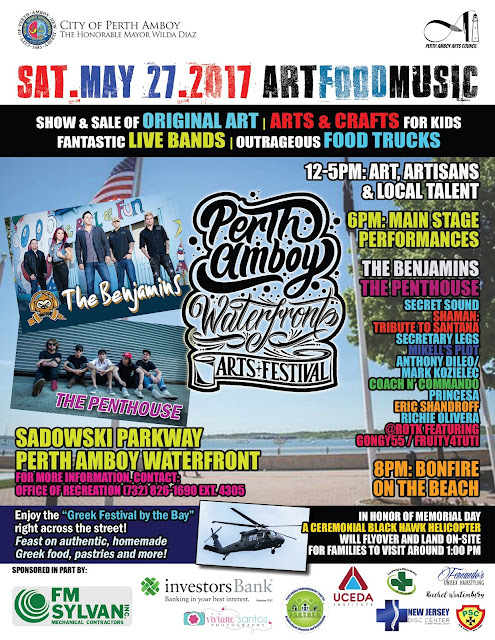 This festival, sponsored by the Perth Amboy Department of Recreation and the office of the mayor, provides artists in the community with the opportunity to exhibit and sell the their artwork, gives local bands an opportunity to perform, exposes city residents to arts and culture and attracts art and music loving crowds from all over the state. 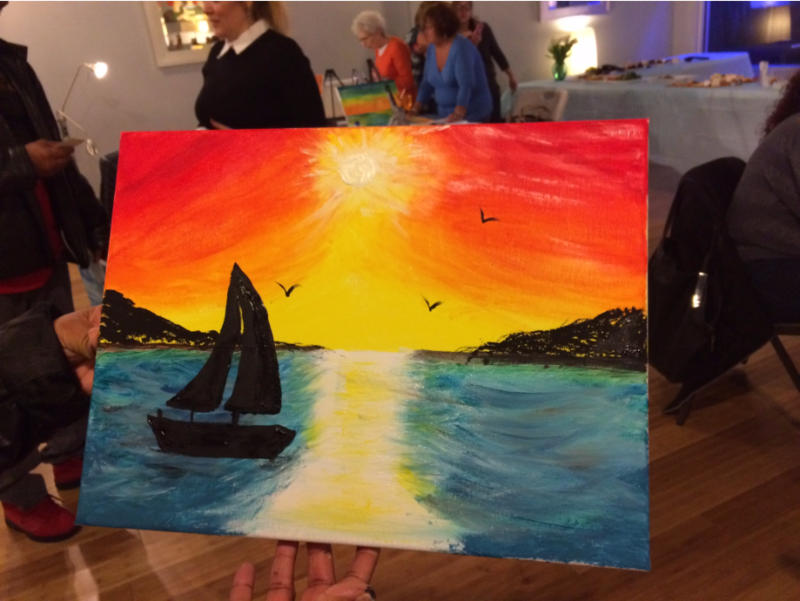 Once people visit the city and see how beautiful it is, they are likely to return for other cultural events, spend a day at our beautiful waterfront or come back to eat at one of our many award winning restaurants. 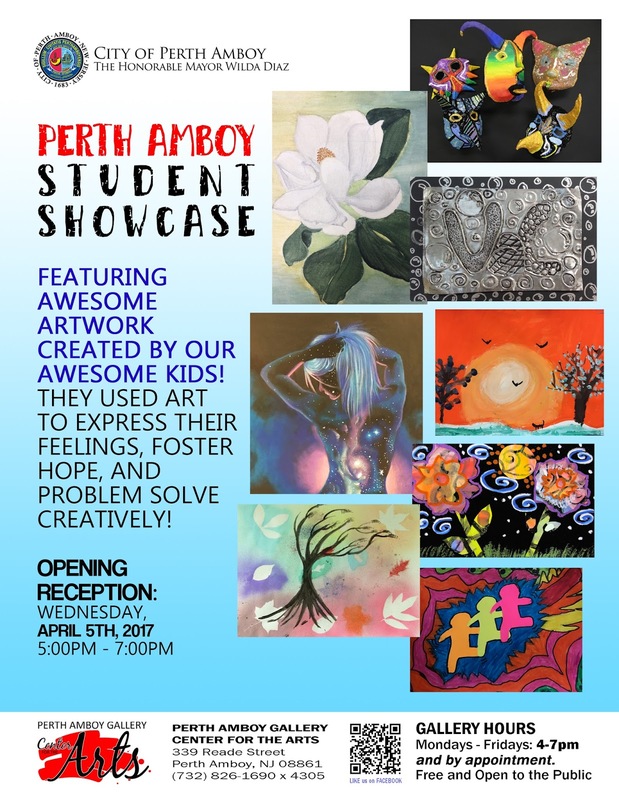 I am proud to be a part of this initiative to put Perth Amboy on the map as a destination for entertainment, arts and culture. Department of Recreation Director Ken Ortiz, Me and Manny Pacheco, Music Teacher at Perth Amboy Gallery Center for the Arts. 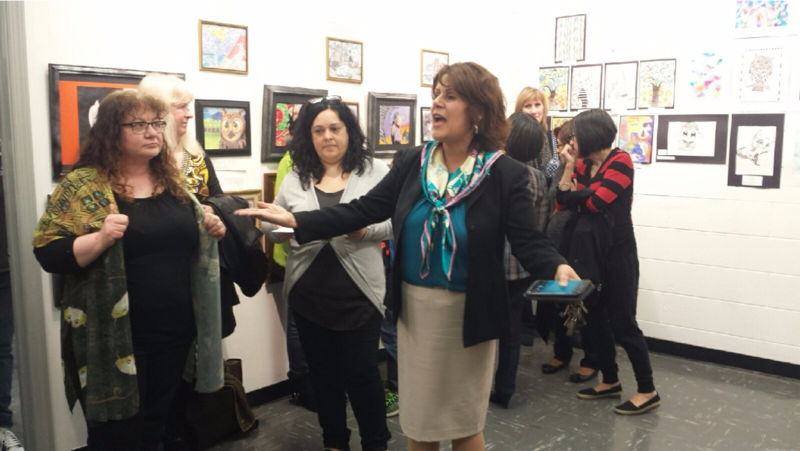 It takes many people to organize a successful festival. Every year, Pat Johnstone, my fellow art teacher at Samuel E. Shull School, and I plan a family art night for the school community. 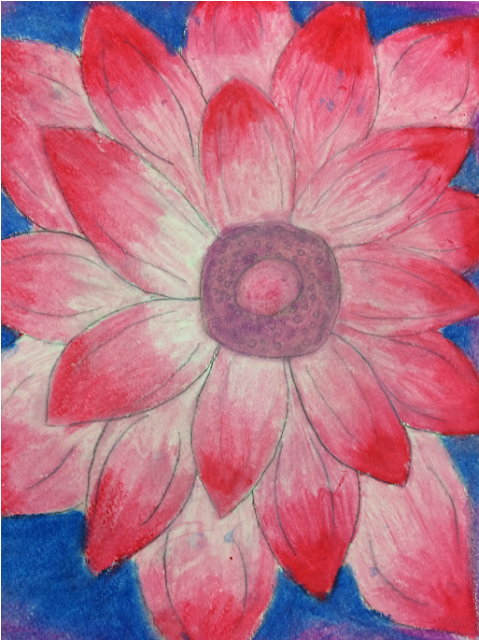 This year everyone used oil pastels to create magnificent flower pictures for Mother's Day. 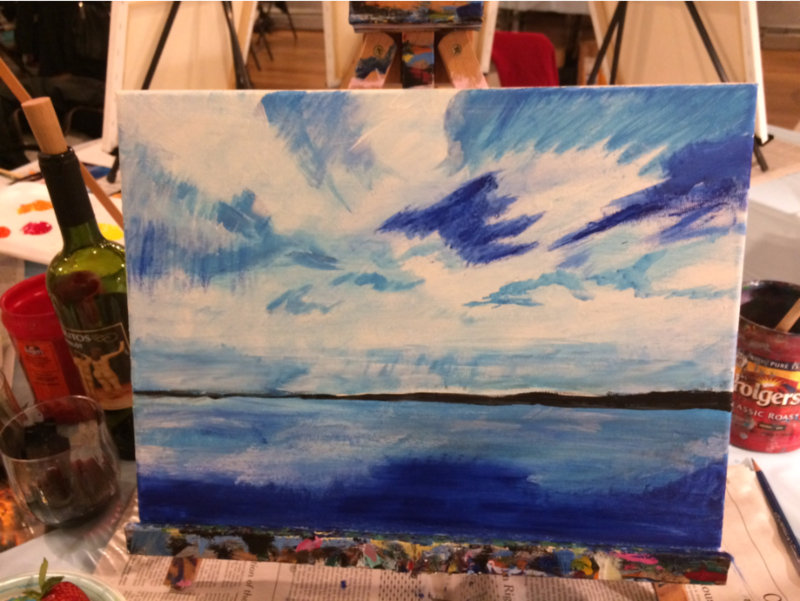 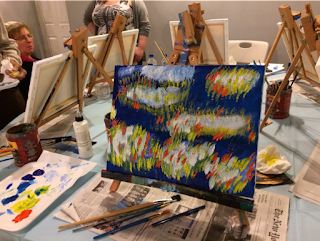 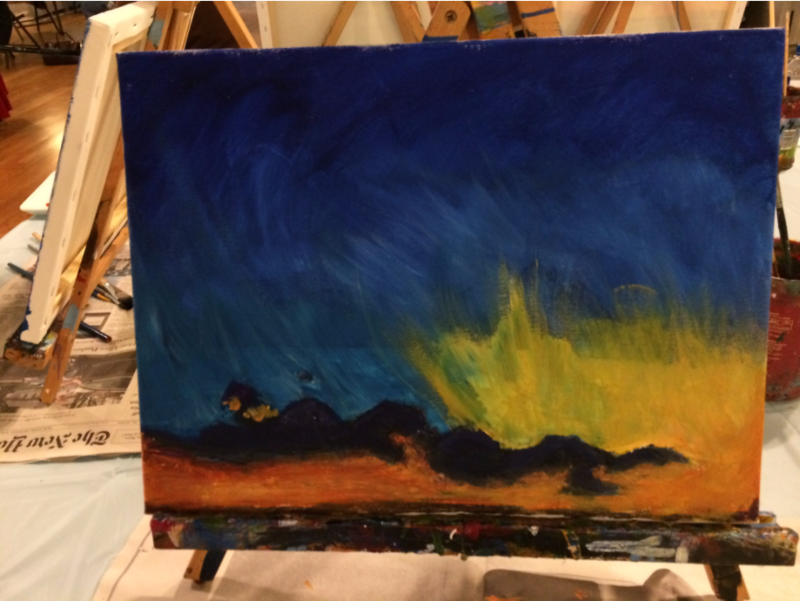 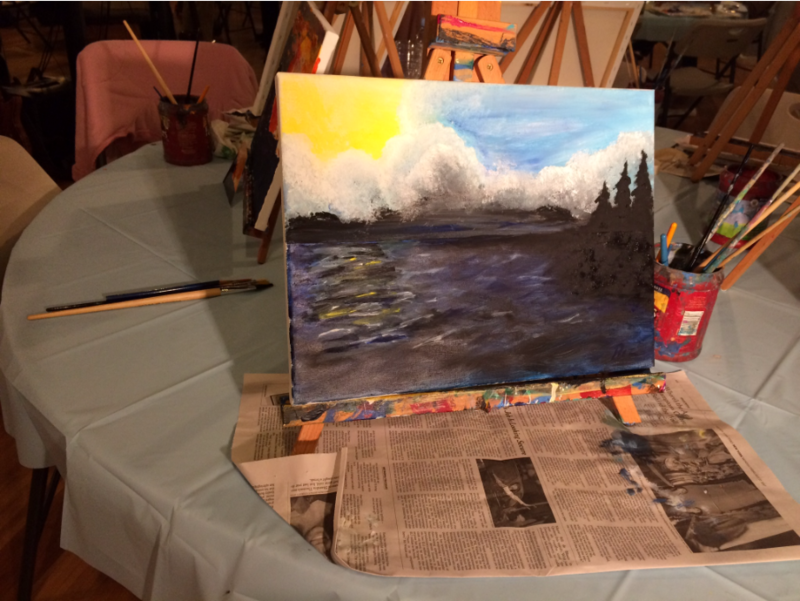 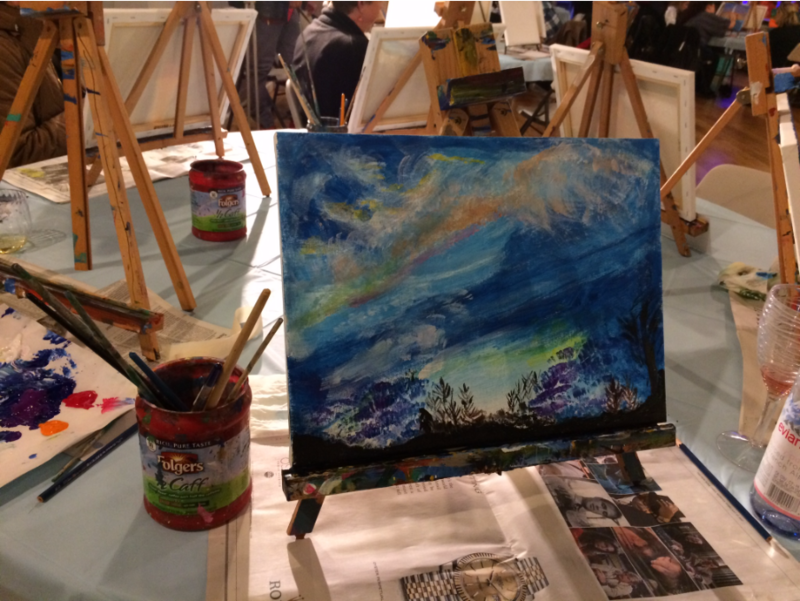 We taught Shull School families how to use Q-tips and baby oil to blend the colors, creating a painterly effect. 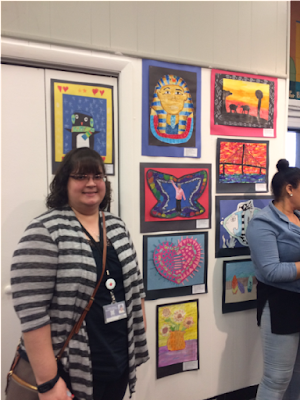 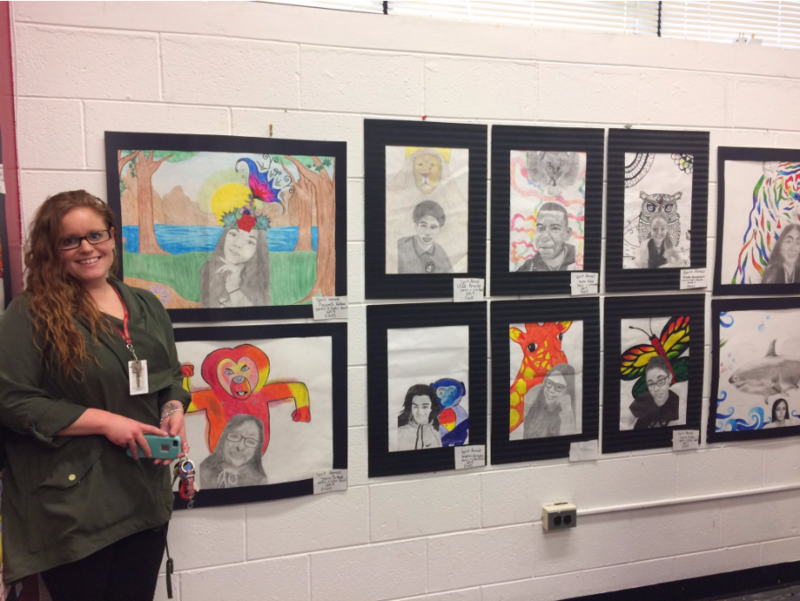 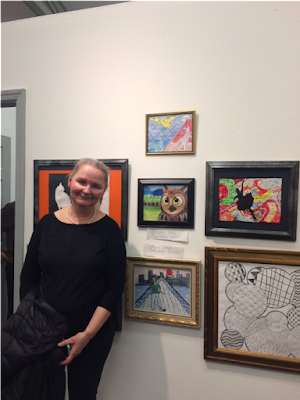 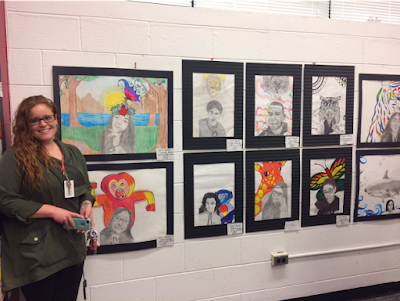 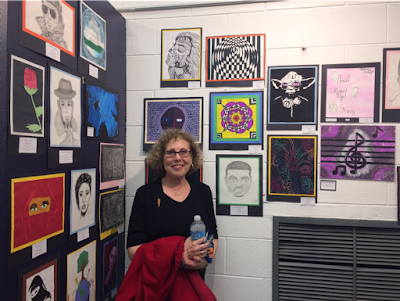 McGinnis School art teacher, Mrs. Ostermann, in front of her students' artwork. 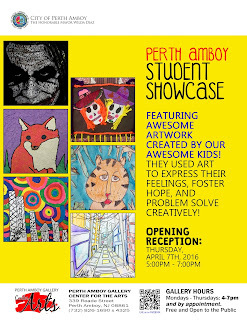 Some artwork from Perth Amboy Catholic Schools can also be seen in this shot. One thing I have learned over the years is that it takes a village to support the arts and to recognize the value of the arts in building a stronger community. We in Perth Amboy are extremely fortunate to have leadership that recognizes the inherent value of the arts in our children's education. You can see that here at the board of education meeting where I spoke. 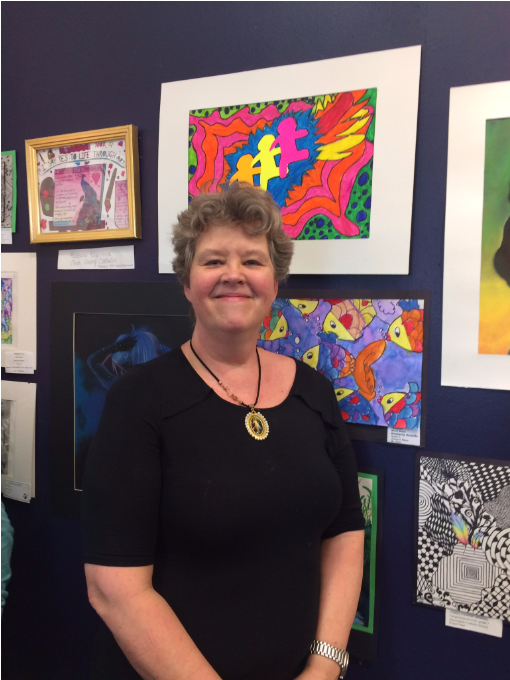 Scroll ahead to me, speaking for one minute and forty seconds (starting six minutes and twenty seconds into this video and ending at the eight minute mark) advocating for our kids. 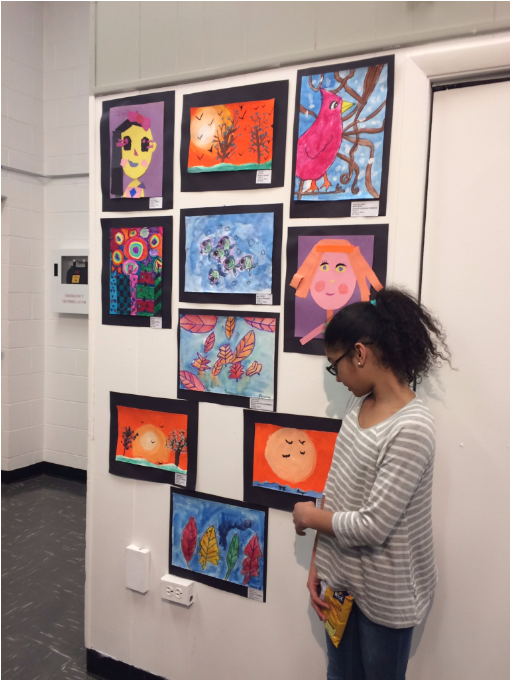 The board approved the art show unanimously. Each child gave a speech presenting their artwork and we are now awaiting a final decision from the judges. 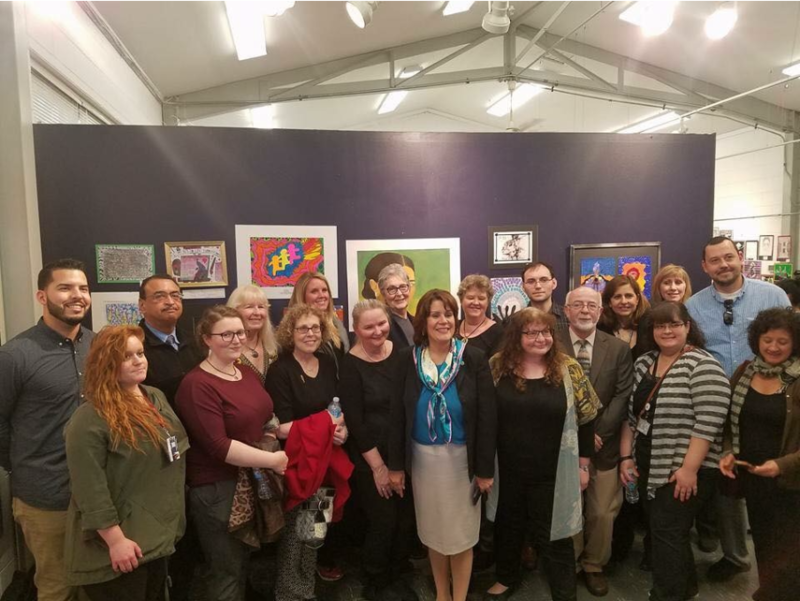 Saturday, March 25th was New Jersey Maker's Day. The Perth Amboy School district participated by having a maker event, open to the public, at the Samuel E. Shull School Library. I am proud to say that I participated by showing members of the community how to build marble roller coasters. 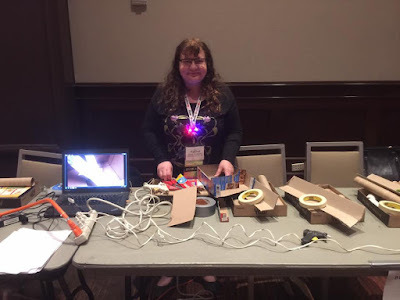 During the event I was able to share with my fellow art teachers from across the country how I teach creative problem solving and design thinking using recycled materials. The teachers were as exited to learn as my students are and it was a very rewarding experience. All set up to create marble runs! 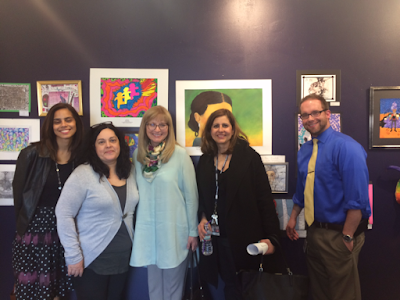 These art teachers had so much fun collaborating and inventing! and go to page 15. 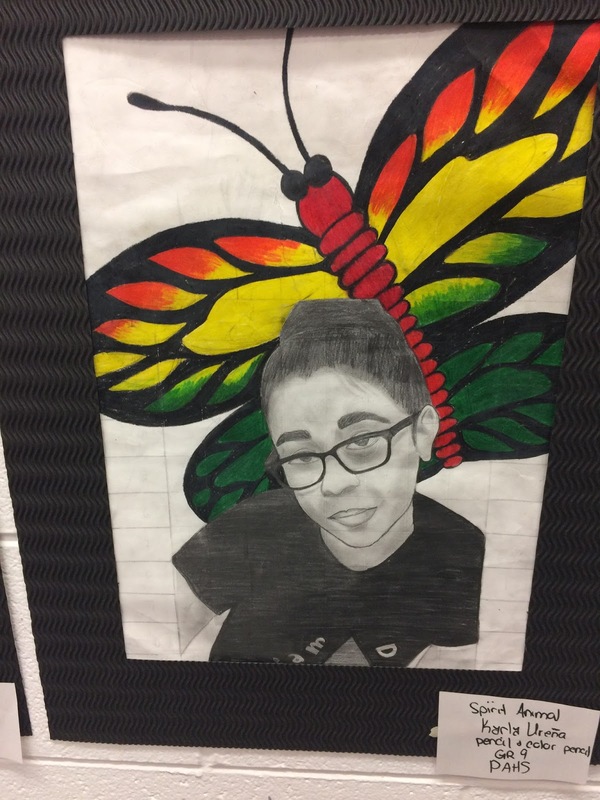 In March of 2017, School Arts Magazine published the magnified leaf drawing of my 7th grade student Warlyn Castillo on page 9. 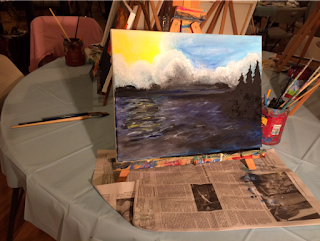 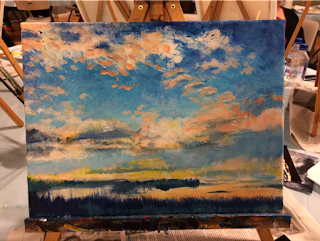 I am proud to announce that the article was re-blogged by Sax Arts and Crafts. You can read it by clicking here. Talented students from Samuel E. Shull School, James J. Flynn School, William C. McGinnis School, Perth Amboy Adult Education Center and Perth Amboy High School participated in this event at the Barnes & Noble at Menlo Park Mall in Edison NJ. 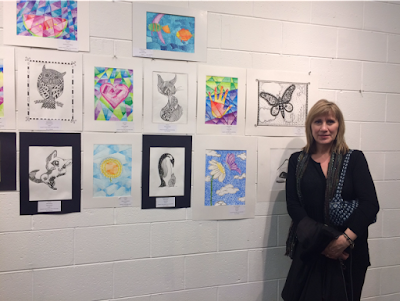 We are so proud of our talented kids and dedicated art teachers! 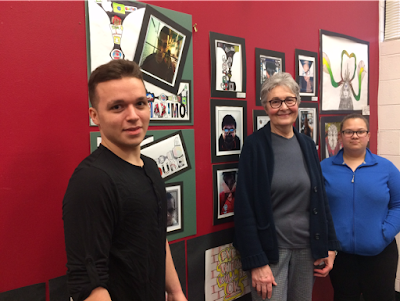 We are grateful to the Friends of the public library and Barnes & Noble for providing us with this wonderful opportunity to showcase our talented students artwork. 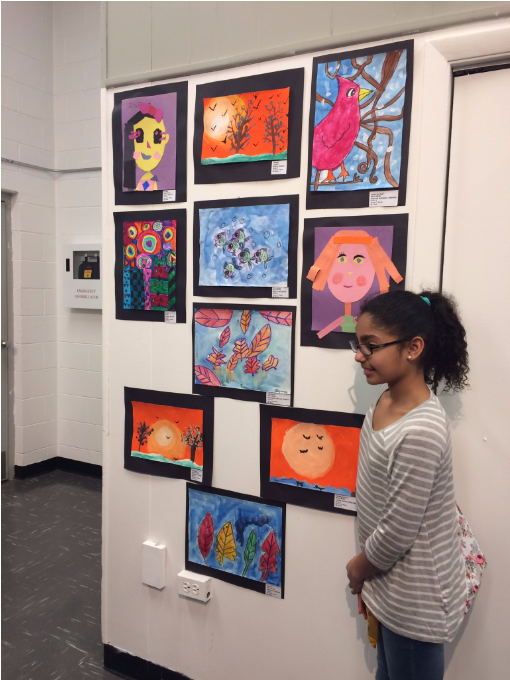 In 2016 I organized a city wide student art show at Perth Amboy Gallery Center for the Arts. Every school in the city, public, private and charter, was invited to participate. 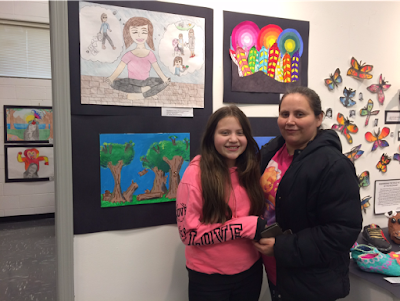 Parents, teachers, administrators and community members came together to celebrate their students's accomplishments. In June of 2016 the Samuel E. Shull School community came together to help save the monarch butterfly. 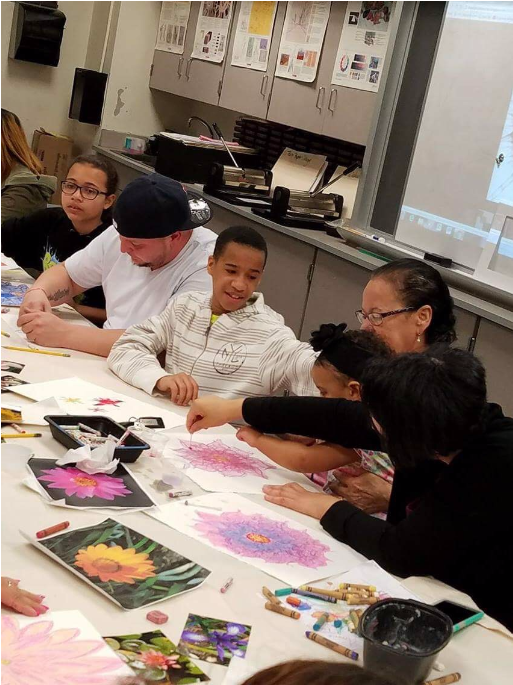 After learning about how we can help to save this endangered animal, families were given free seed packets to start butterfly gardens. 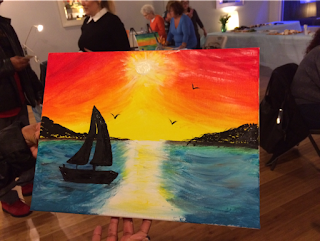 Everyone had fun creating beautiful unique watercolor paintings. 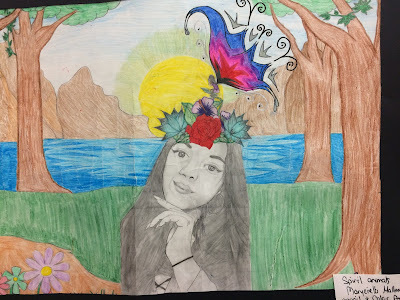 Bloom's Taxonomy in the art room. I presented this lesson as a webinar for the National Art Education Association in October of 2015, at Education Closet's Winter Conference is February of 2016 and at Rutgers Graduate School of Education's Institute for Improving Student Achievement in November 2016. 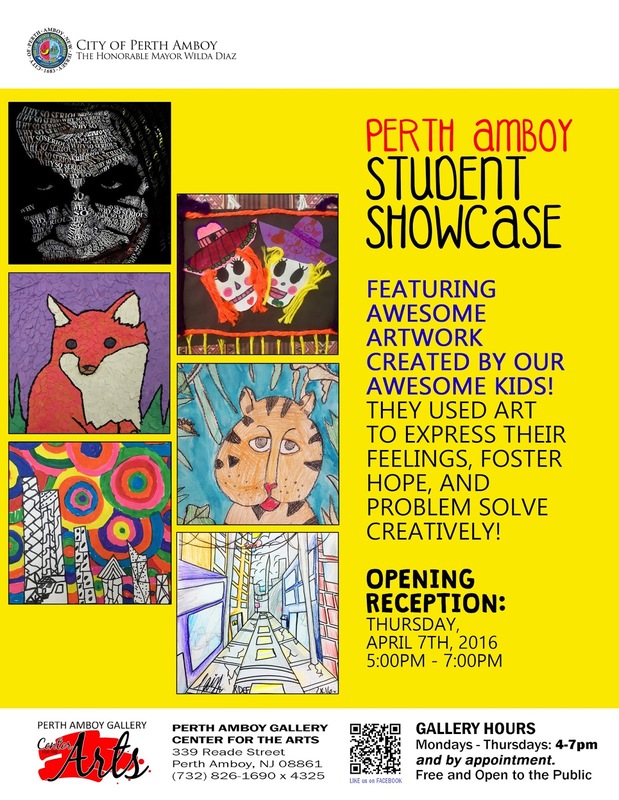 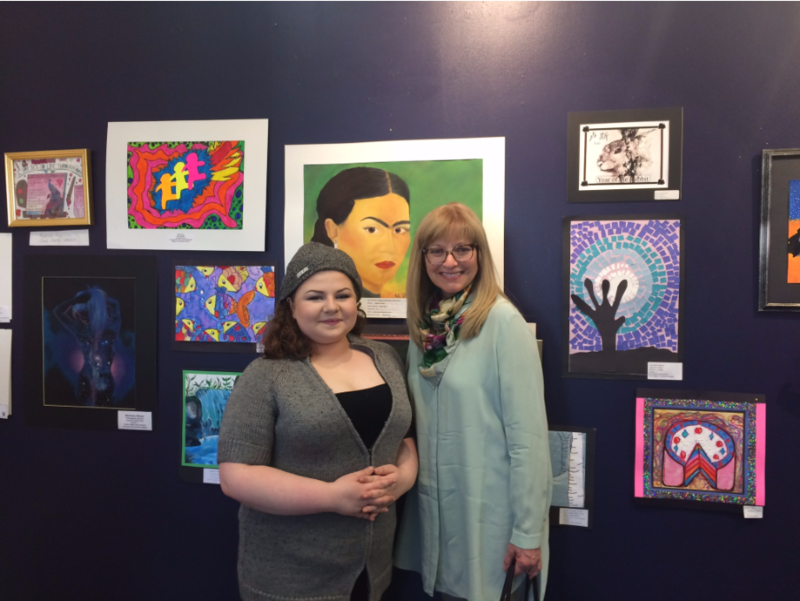 It would be impossible to discuss Student Art Exhibits and Community Events without mentioning the Perth Amboy Gallery Center for the Arts. 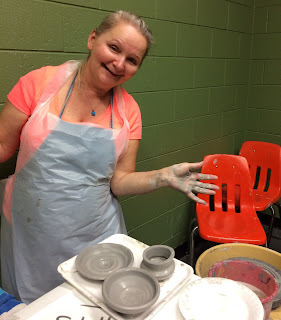 I teach ceramics classes at the art gallery, for both children and adults. 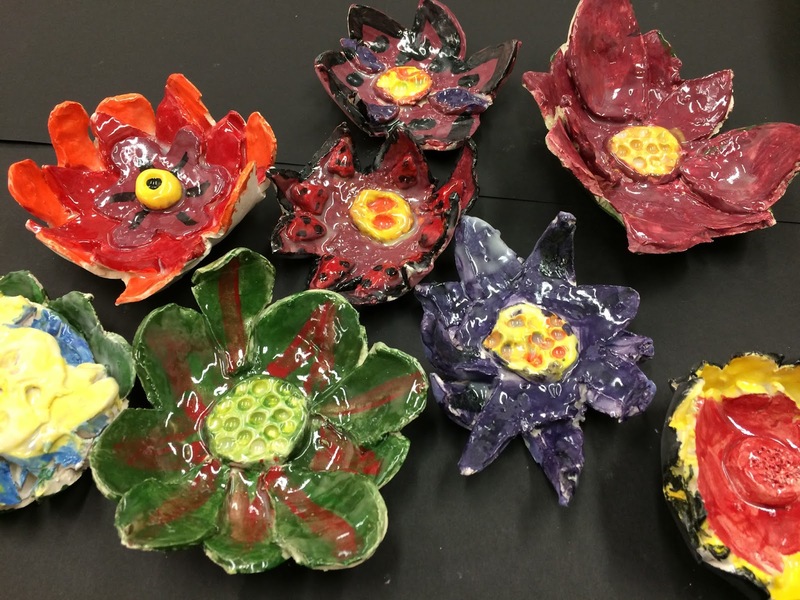 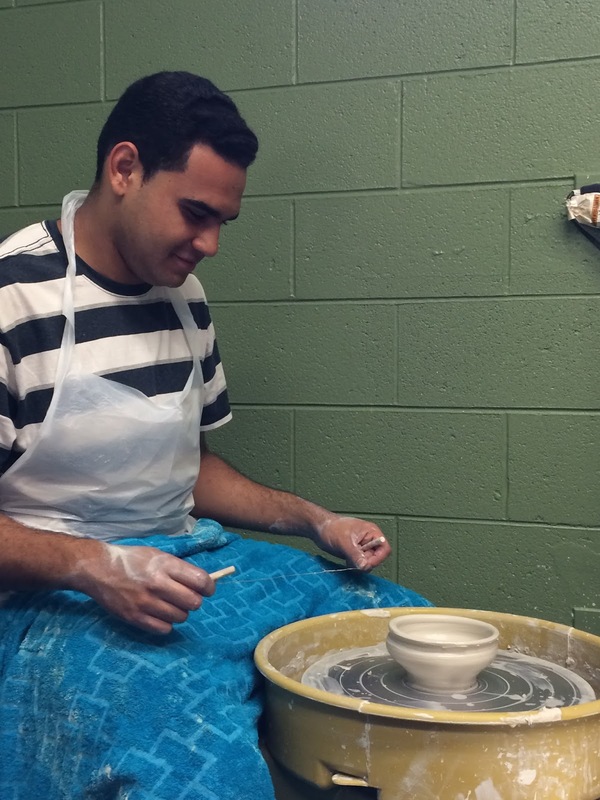 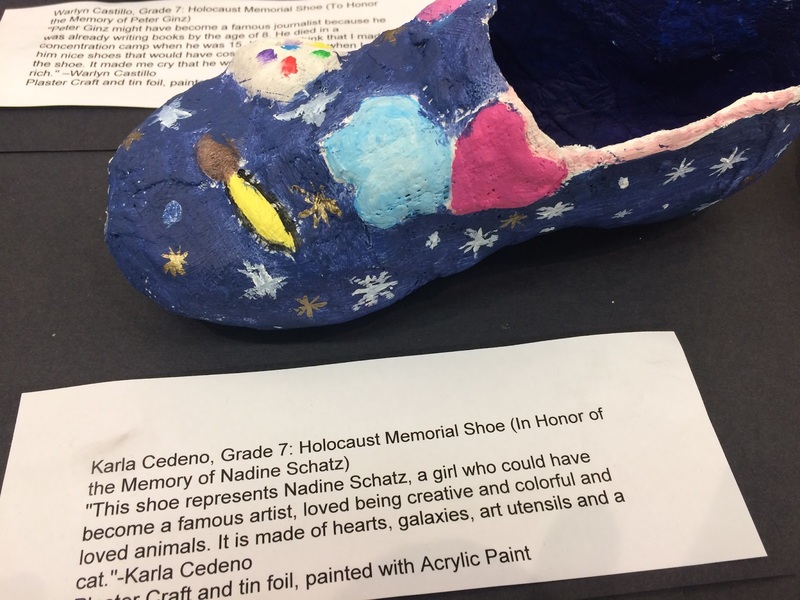 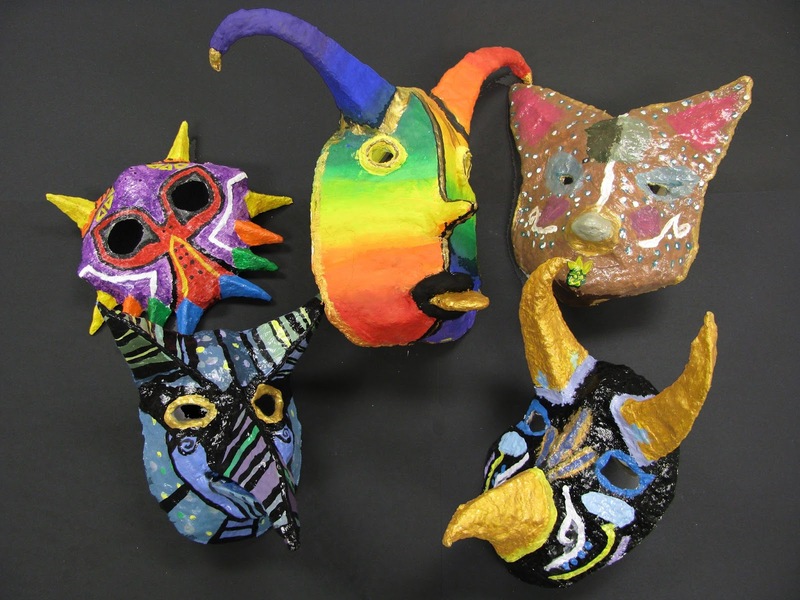 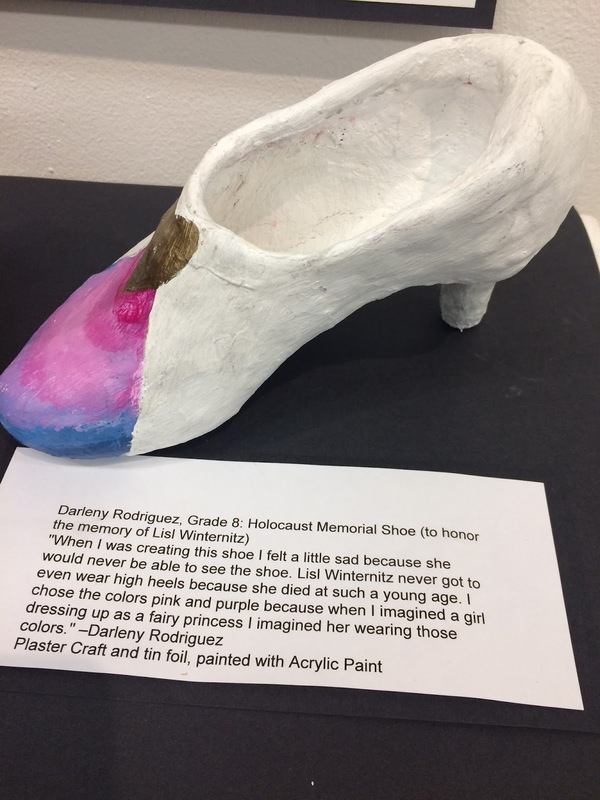 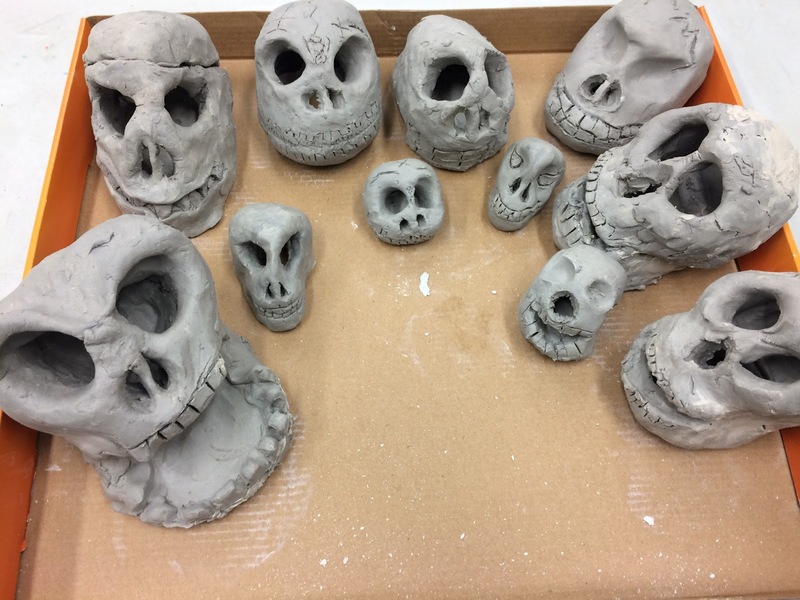 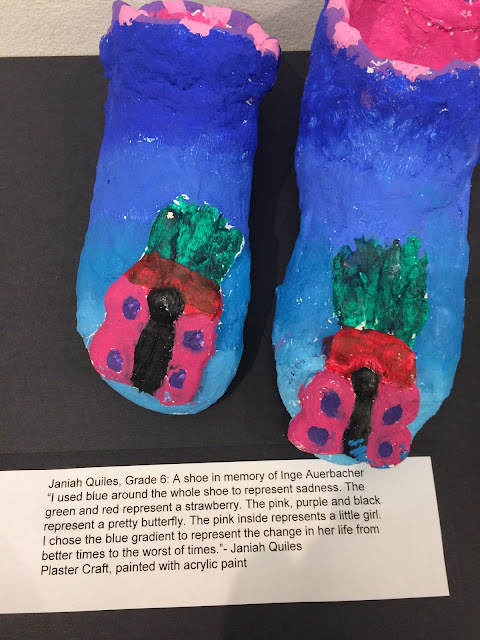 My students have included four Perth Amboy Public School art teachers in the past year, all seeking to revitalize the ceramics programs in their schools, as well as local artists and students. In 2015 I joined the board of trustees of the non profit organization, Perth Amboy Artworks. 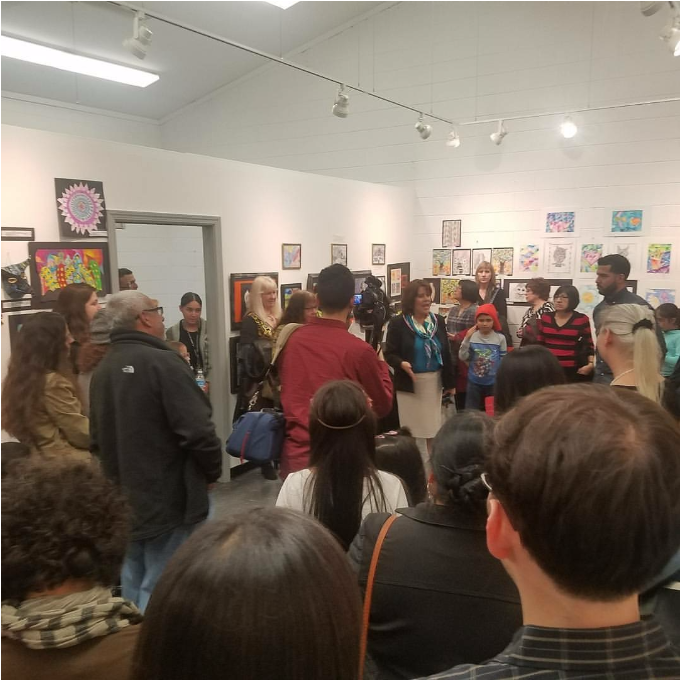 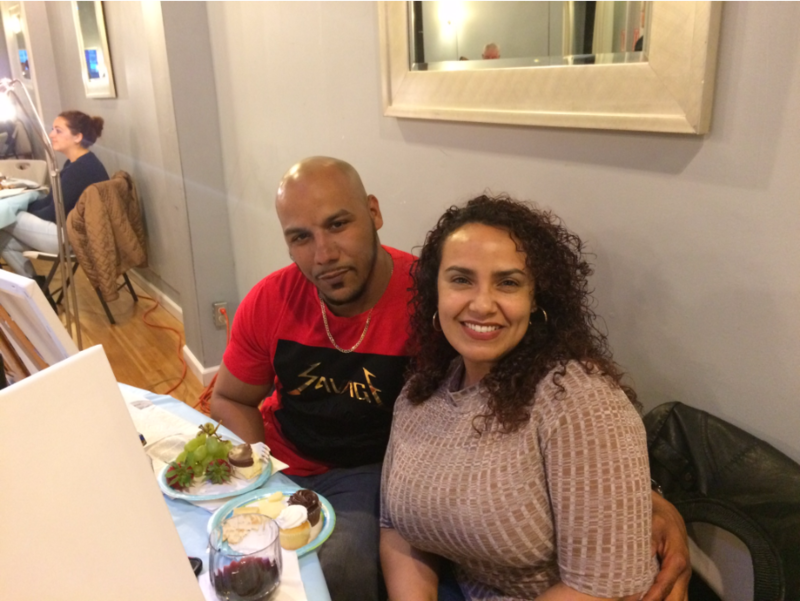 Perth Amboy Artworks mission is to stimulate economic and community development using Arts & Culture to help revitalize Perth Amboy. 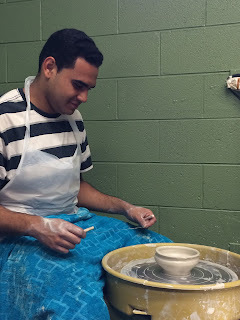 Founded in 2015, we are a nonprofit corporation with 501 c3 tax-exemption status. 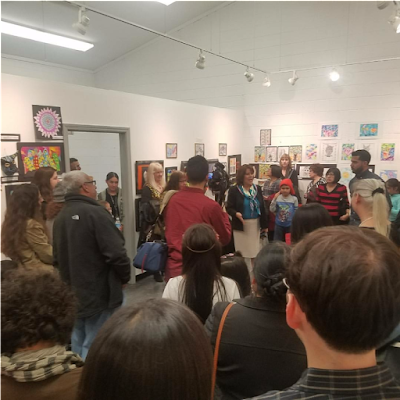 We believe Arts & Culture make communities stronger and more enjoyable places to live and we have experienced first hand the positive impact of community based arts efforts. 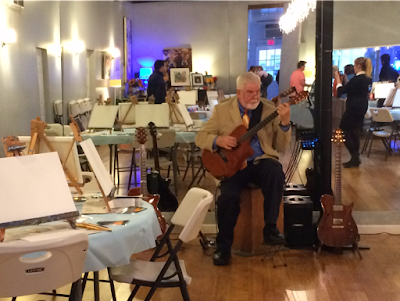 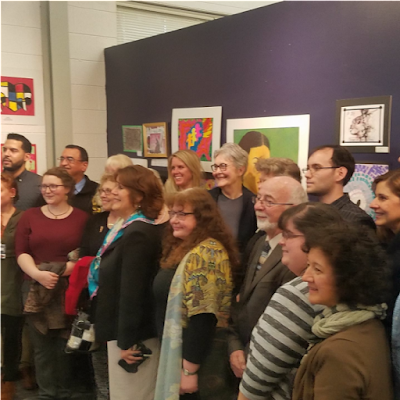 To learn more about the community events and art exhibits that Perth Amboy Artworks has made possible, please click here. 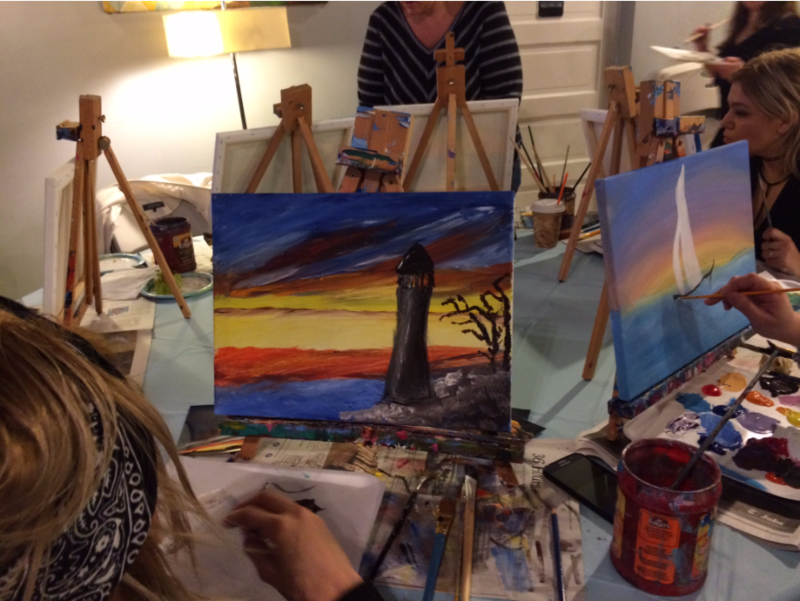 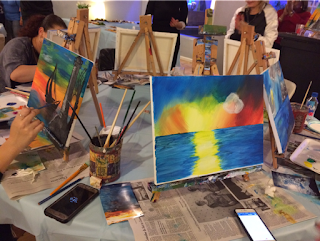 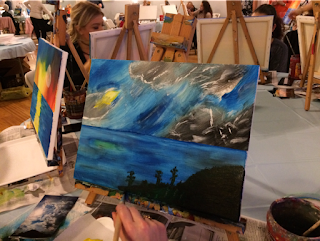 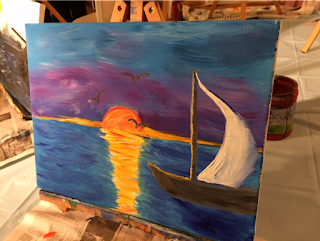 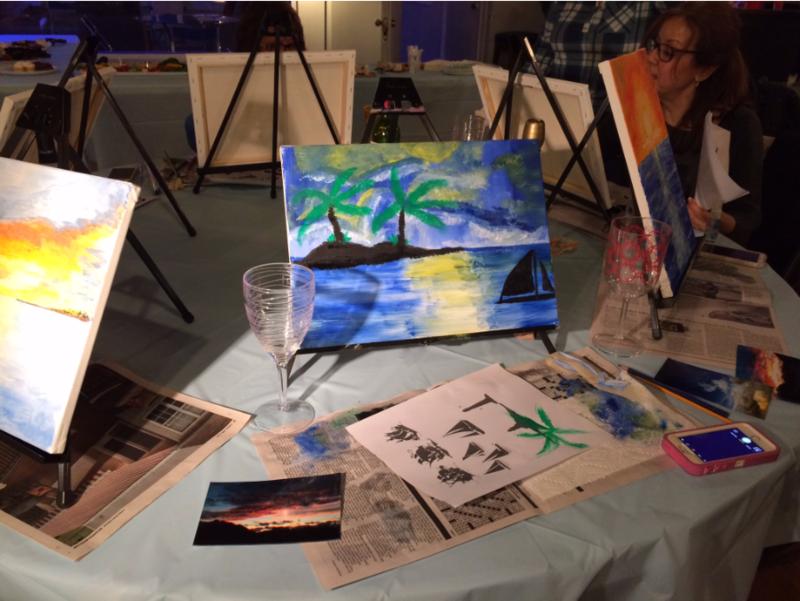 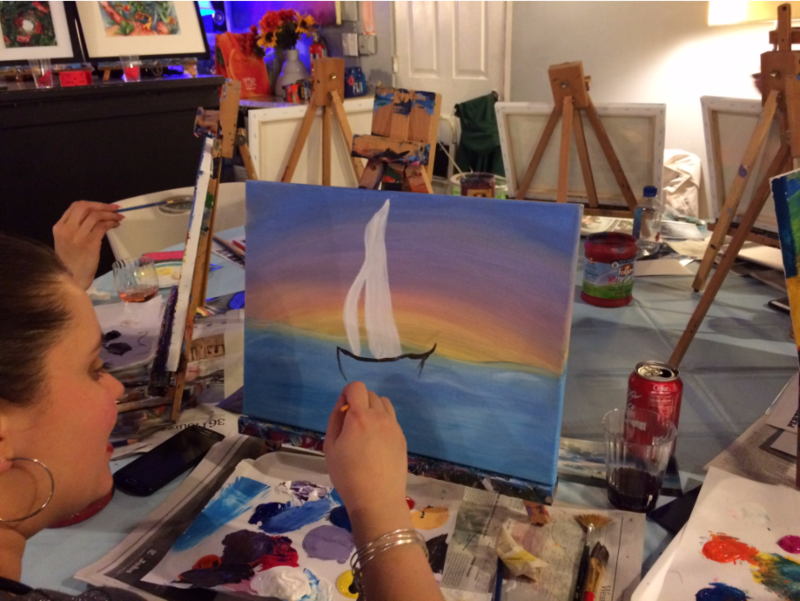 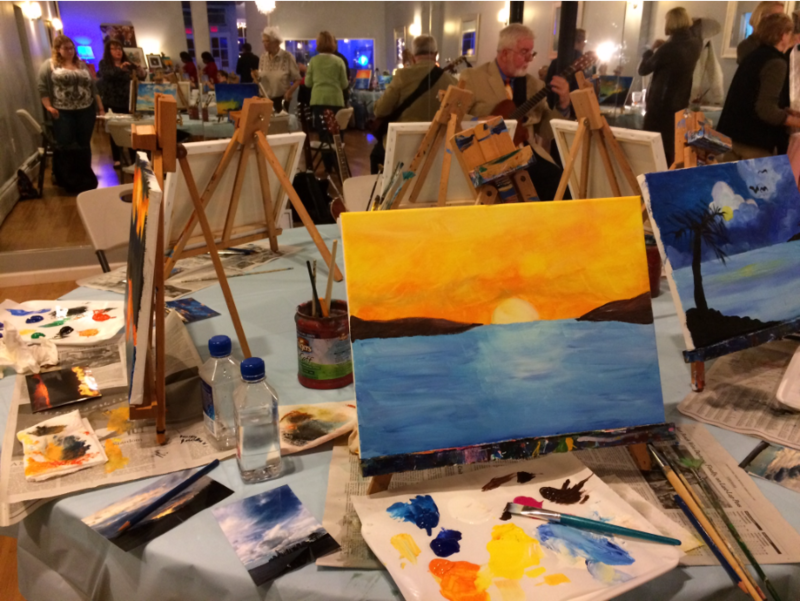 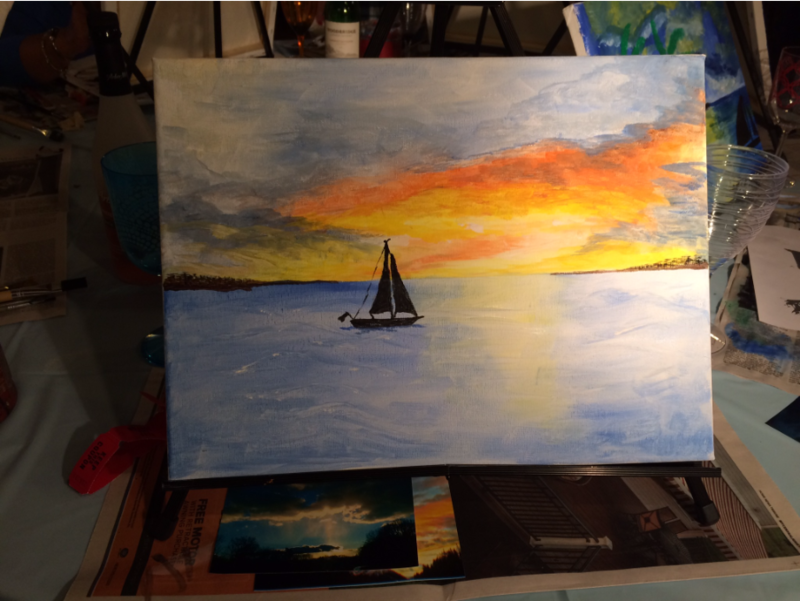 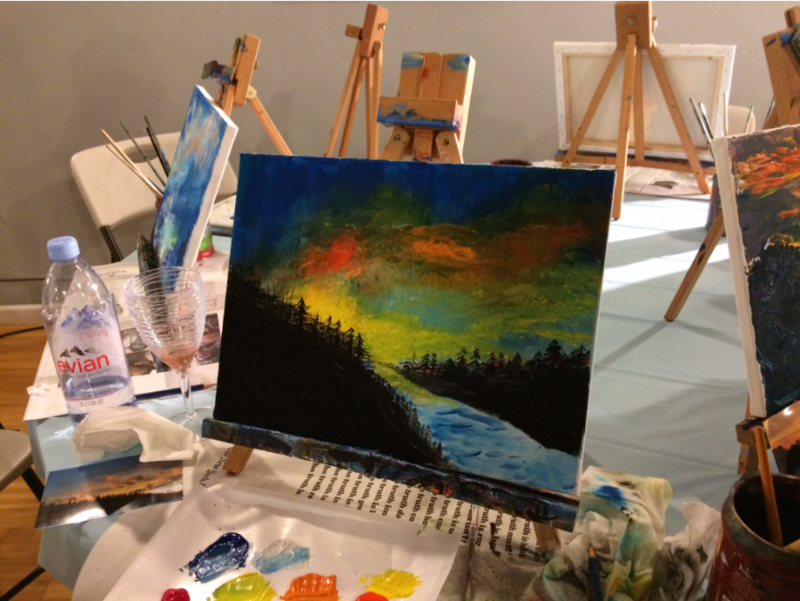 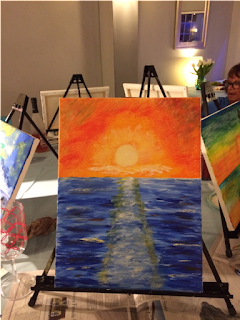 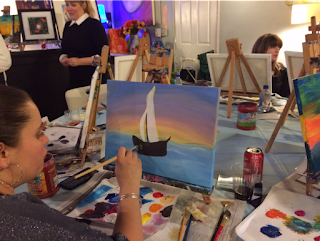 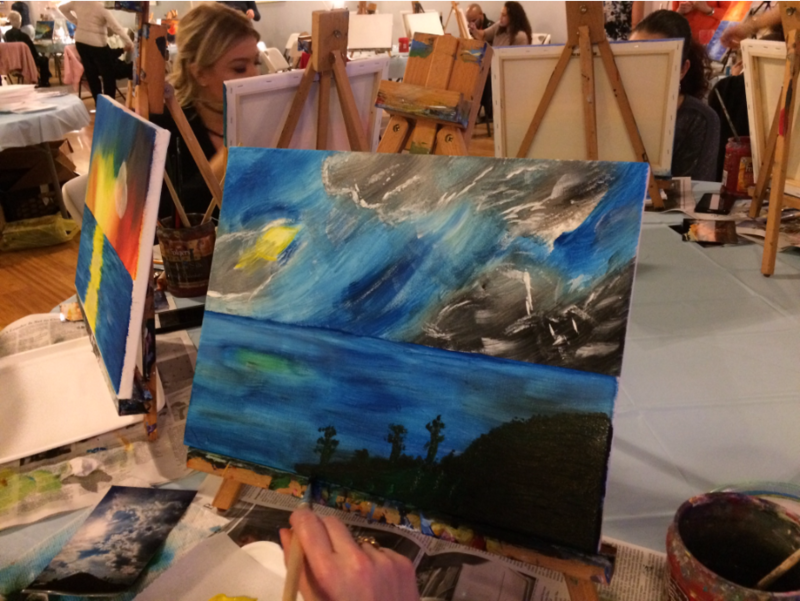 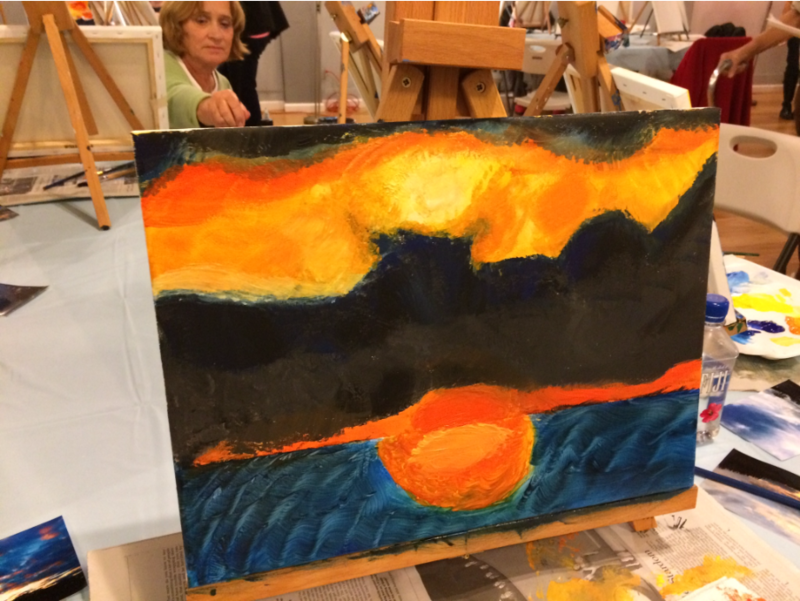 As you can see from the paintings below, while the theme of the evening was nautical sunsets, each painting was unique and each participant had the chance to express their own individual creativity. Everyone got to choose a photograph that spoke to them personally and use it as inspiration for a unique painting. 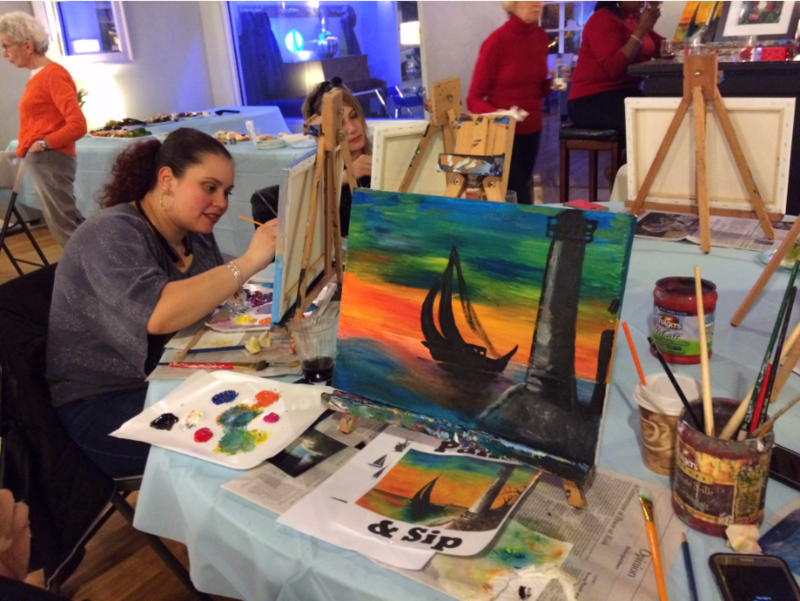 We chose the theme to celebrate the natural beauty of Perth Amboy's waterfront. 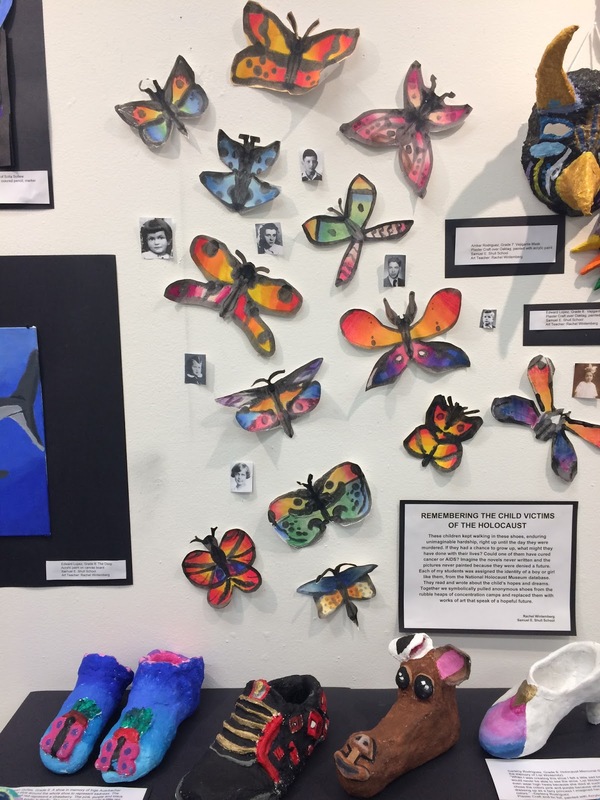 In 2015 the William C. McGinnis Community came together to save the monarch butterfly and celebrate the beautiful artwork created by students that year. 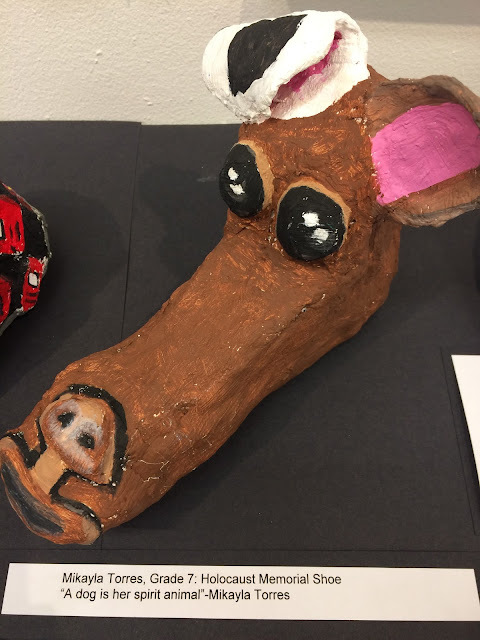 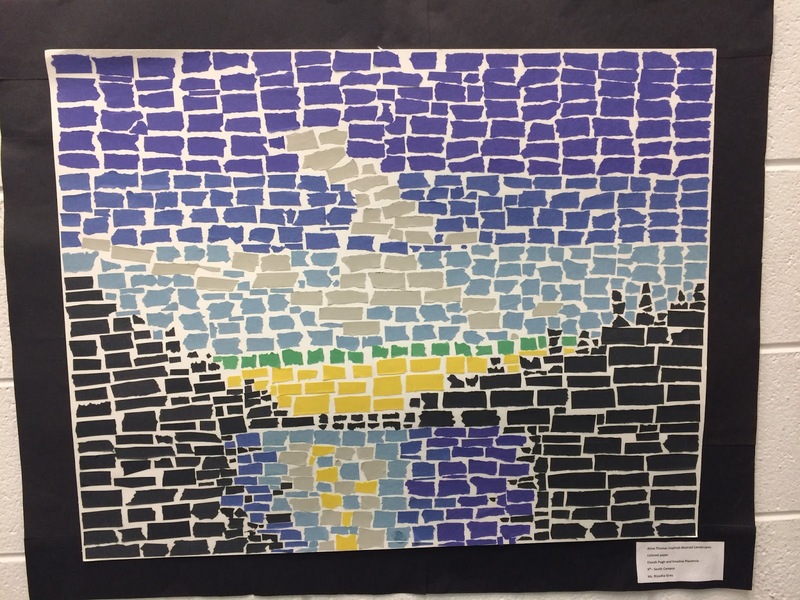 Every student in all of my classes had at least two pieces of artwork in the exhibit. 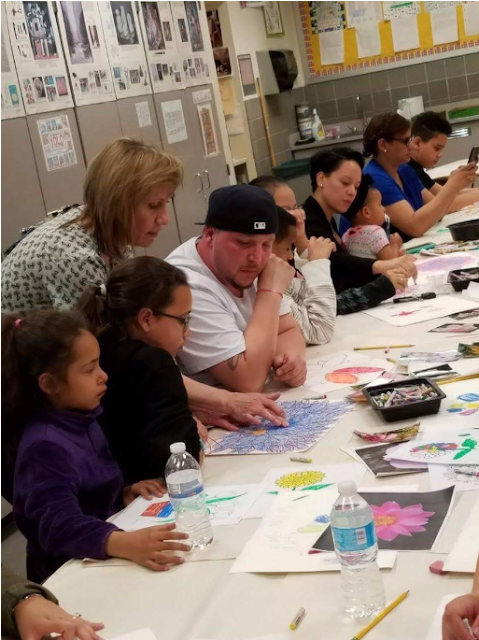 Their families had a wonderful evening painting butterflies, learning about wildlife conservation and enjoying their children's artwork. 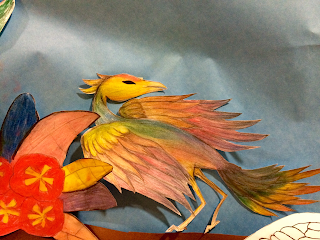 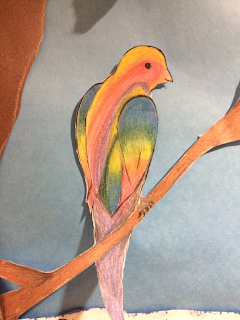 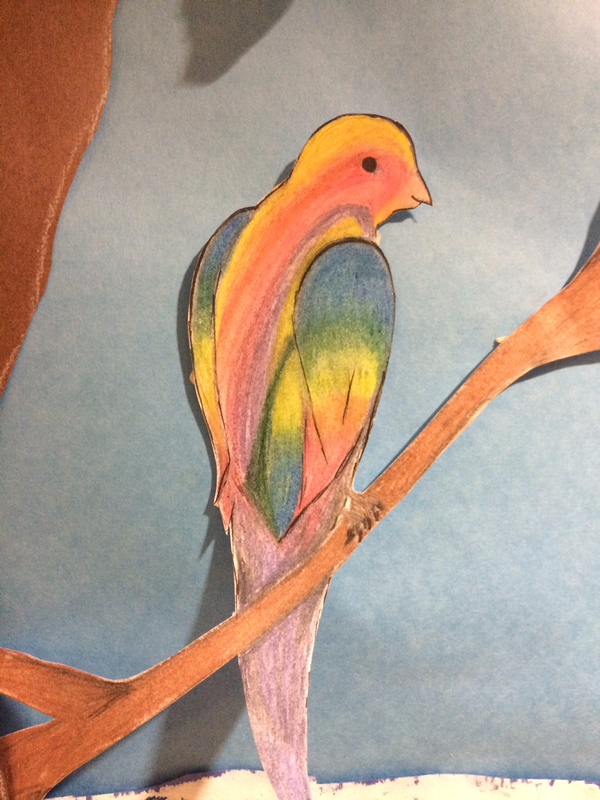 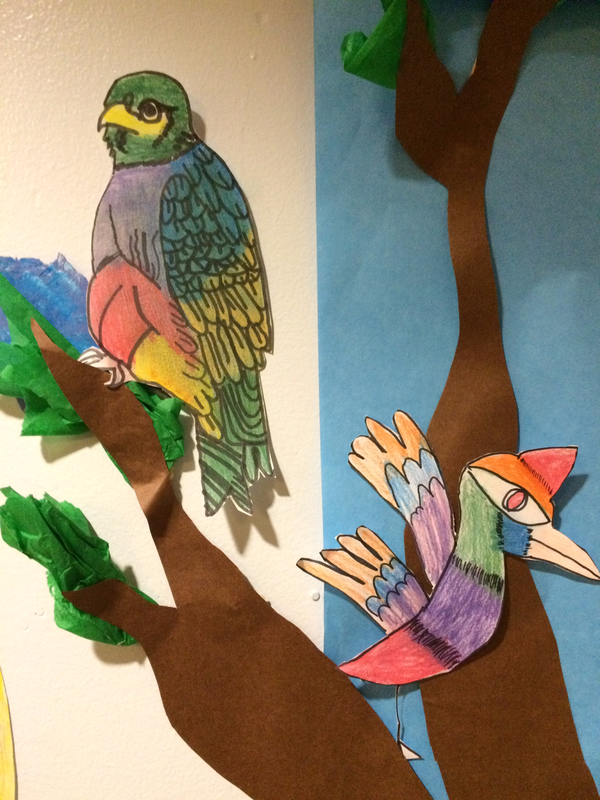 In April of 2015 I started the tradition of having all my students participate in 'Draw a Bird Day'. 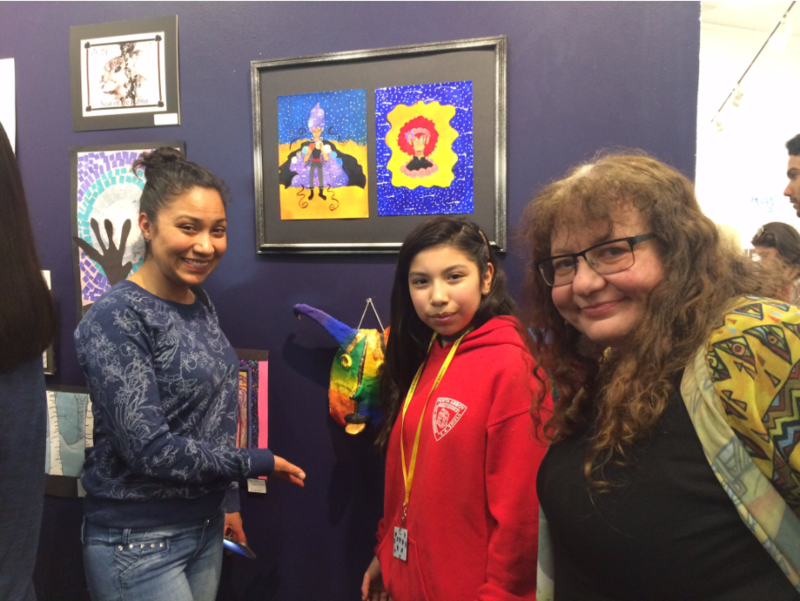 Their lovely mural was showcased in the September 2015 issue of School Arts Magazine. 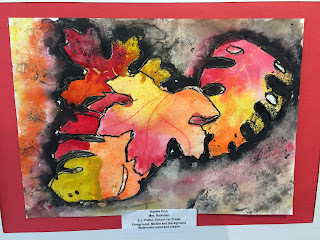 To read all about this project and to see photographs of the student artwork, click here. 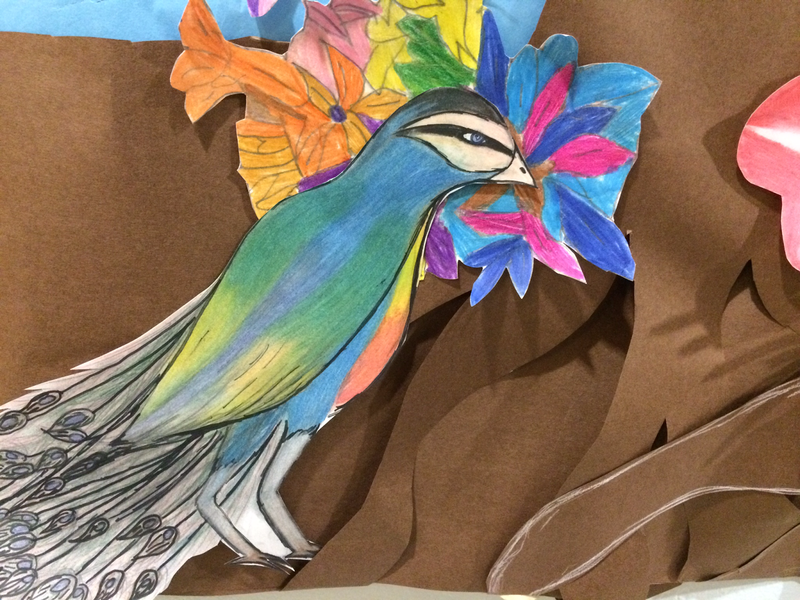 All my students in grades 5-8 contributed at least one bird to this giant mural. By the time we were done the mural extended down the entire ground floor corridor and into the cafeteria. 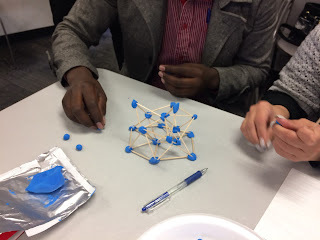 You can read a more detailed account of this interdisciplinary lesson by clicking here. In 2015 the theme of the McGinnis School graduation dance was 'Black and White'. 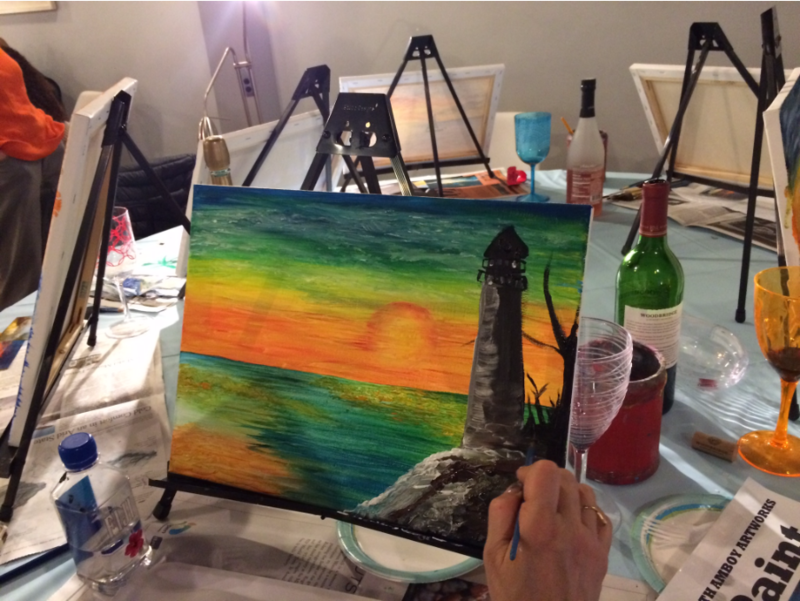 My art club responded by creating this whimsical cityscape. 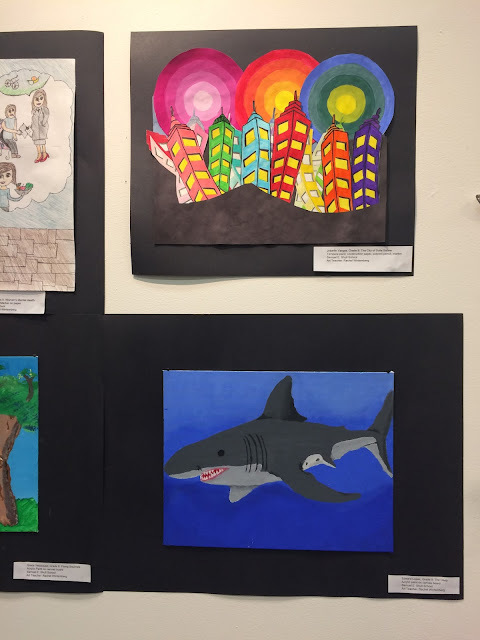 These murals were entirely drawn and painted by volunteer students after school hours. Not only was I able to share the collaborative lesson, but I was able to showcase the creative talents of my 6th grade students with other teachers throughout the country. 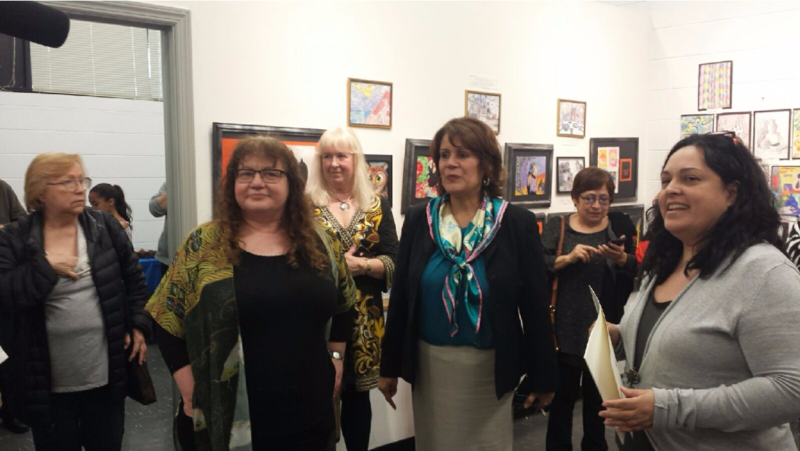 Publishing and exhibiting is an important part of being a working artist. 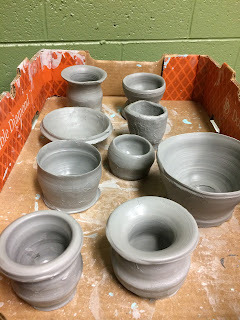 It's never too early to start. 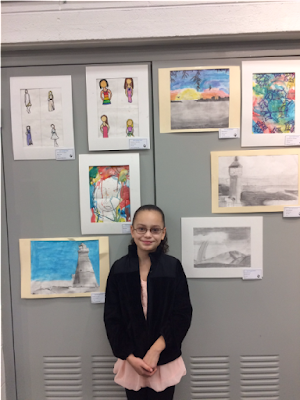 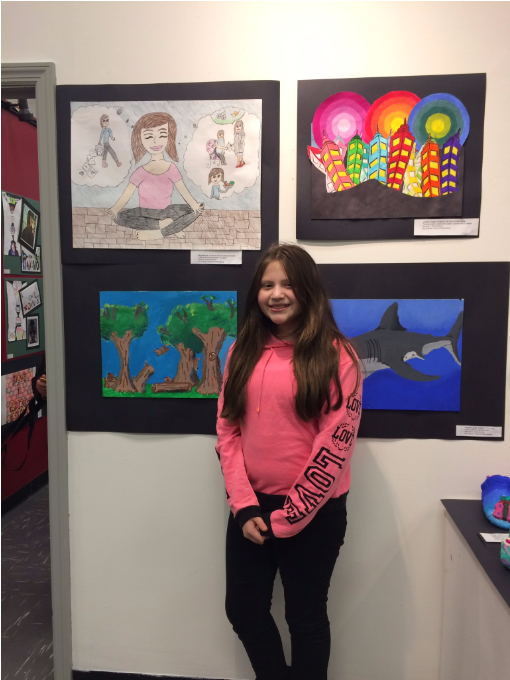 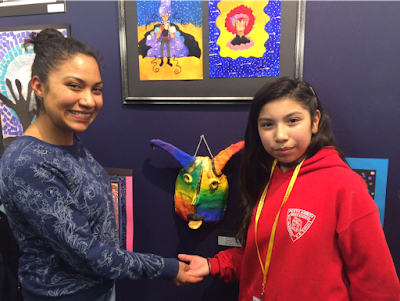 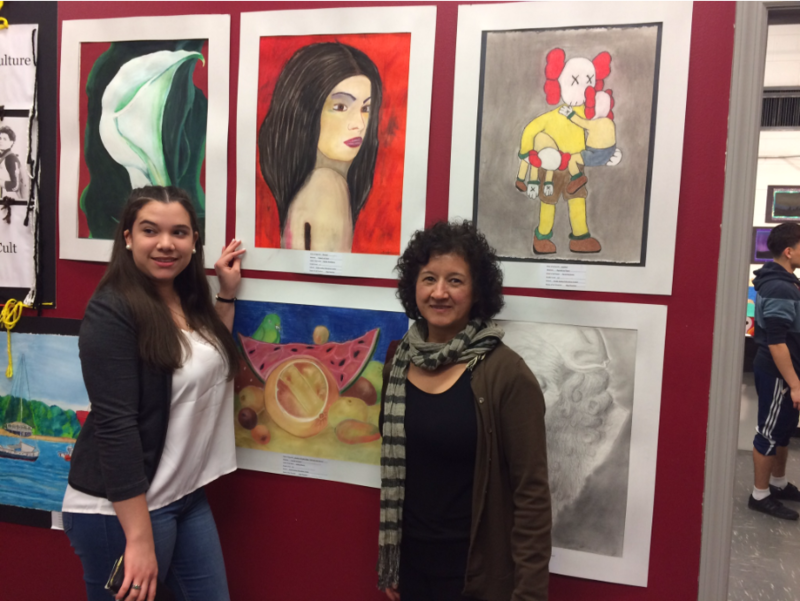 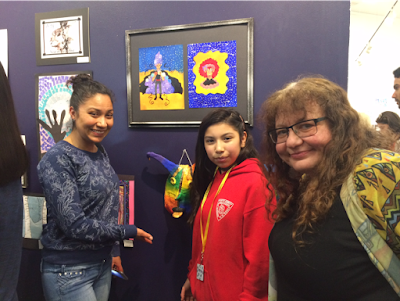 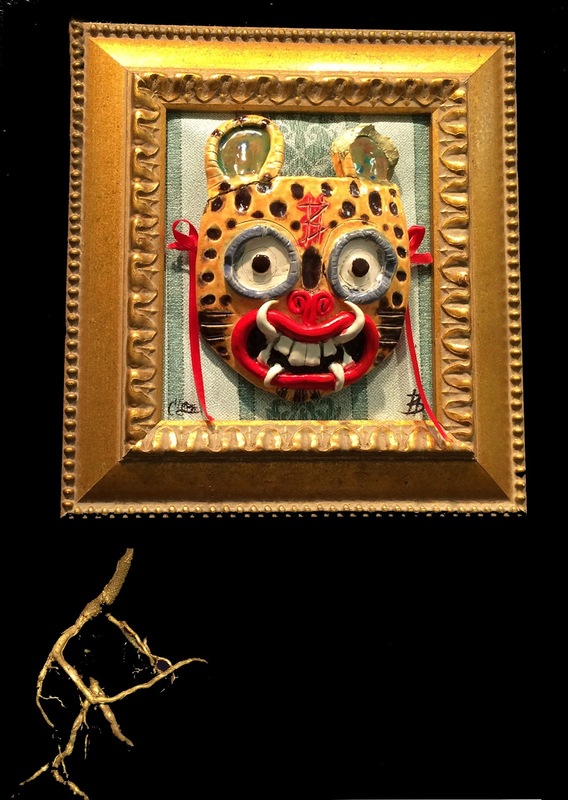 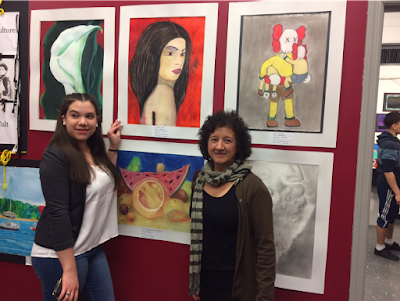 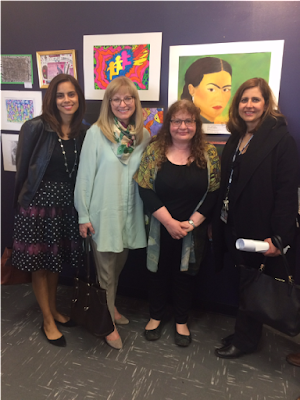 In 2014 one of my 5th grade students, Karyme Estevez, entered The College of New Jersey's Juried K-12 Student Art Show. 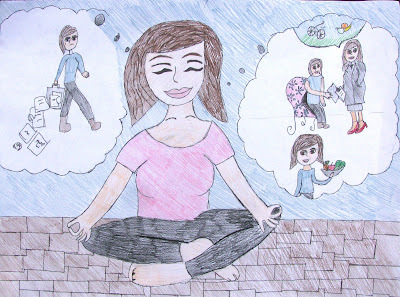 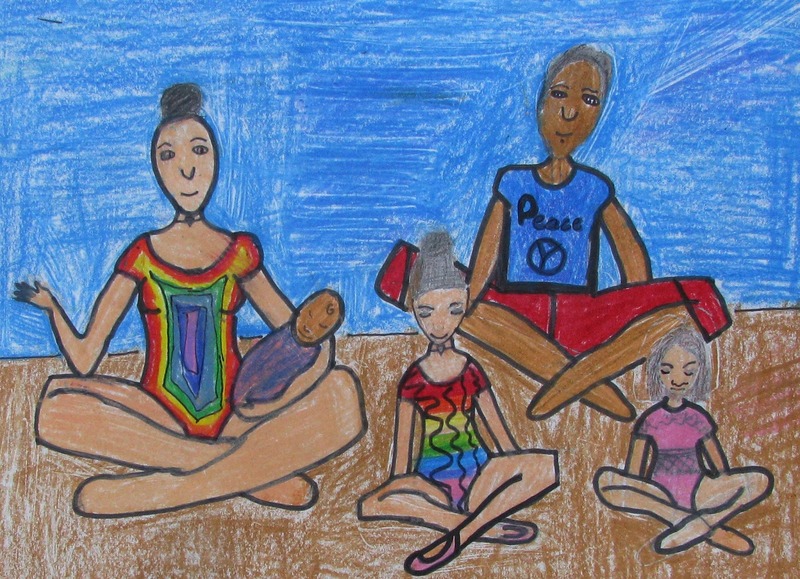 In 2014 my 8th grade student Natalia Dunyak submitted a short story and three illustrations in Stone Soup Magazine. She worked on her illustrations in class and I photographed her work for her. I was very proud to see her artwork published in this nationally distributed magazine the following winter. 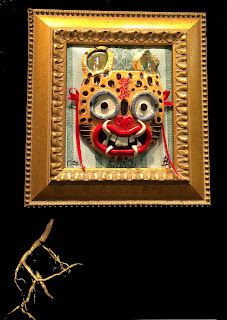 To read her beautiful story click here. 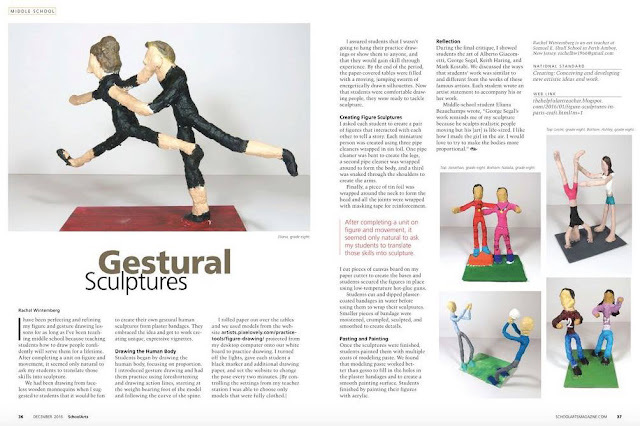 I shared my instructions for creating these lovely giant lollipops in the September, 2016 issue of School Arts Magazine. 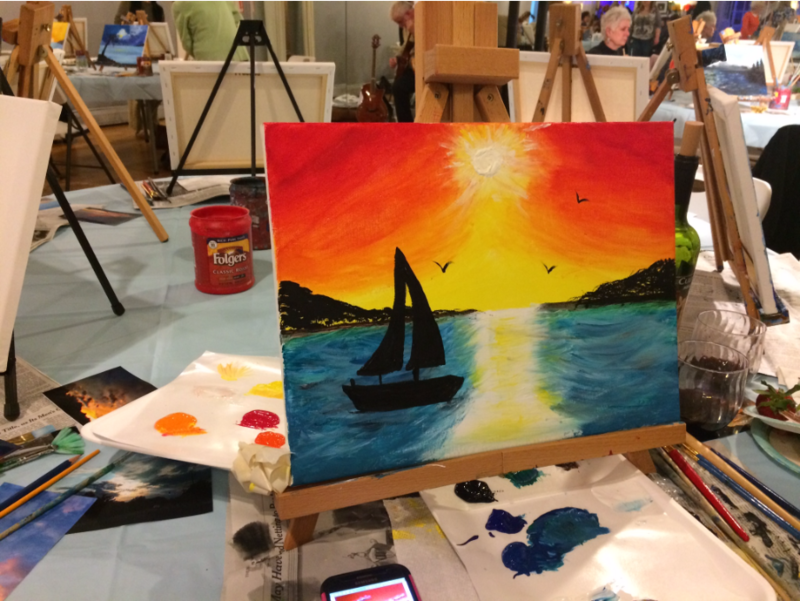 Find out how to create your own by clicking here. 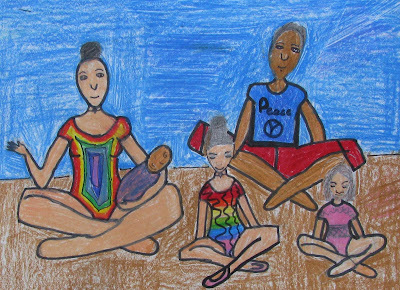 In 2013 my students created a public service animation for the school community. Our message was that without failure there can be no success. 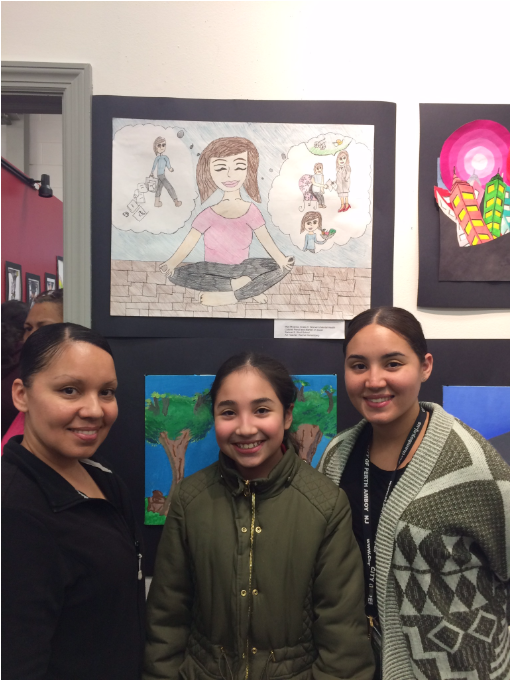 Students created inspiring messages illustrating why it's important to pick yourself up, dust yourself off and keep trying. 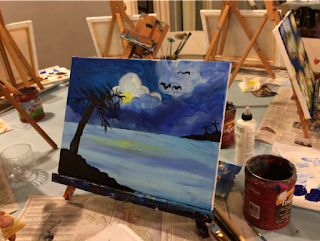 In 2013 the McGinnis graduation dance theme was 'Moonlight in Paris'. 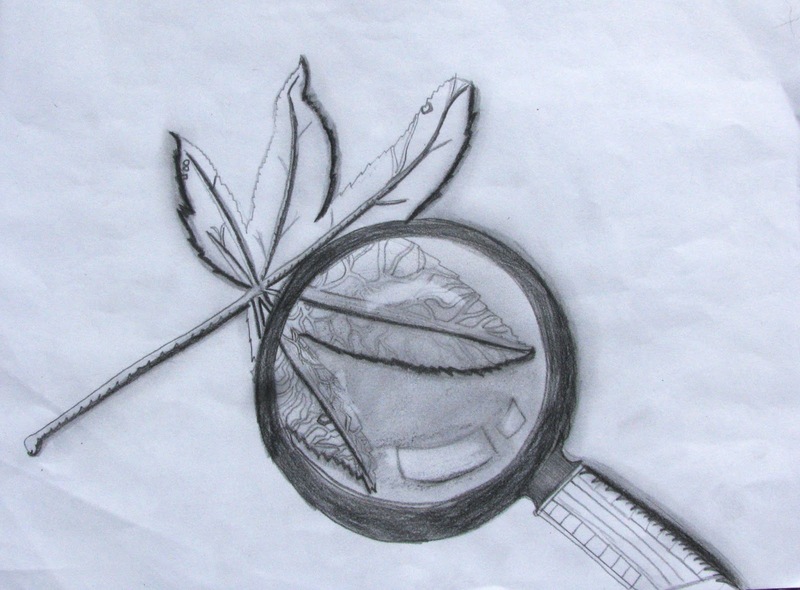 Students eagerly brought me their ideas and sketches. 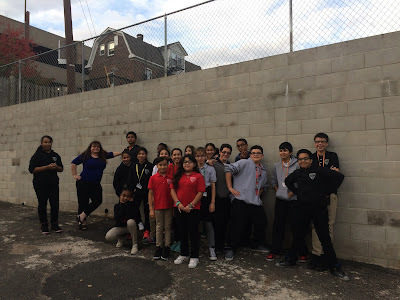 We stayed after school several days a week for several months and made their dreams a reality. In 2012 the graduation dance theme was 'A Night at the Oscars'. Many students volunteered to stay after school with me to create these beautiful murals and props. 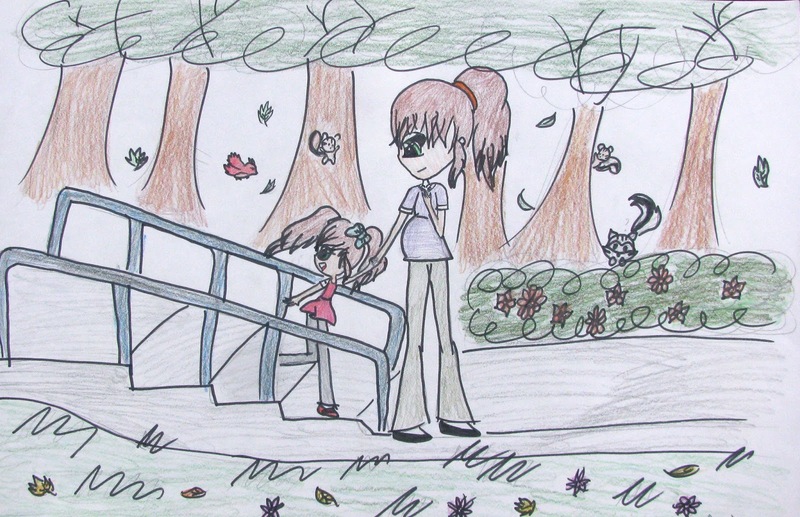 In 2012 every single one of my students created anti bullying animations to help everyone understand the effect that bullying has on children. 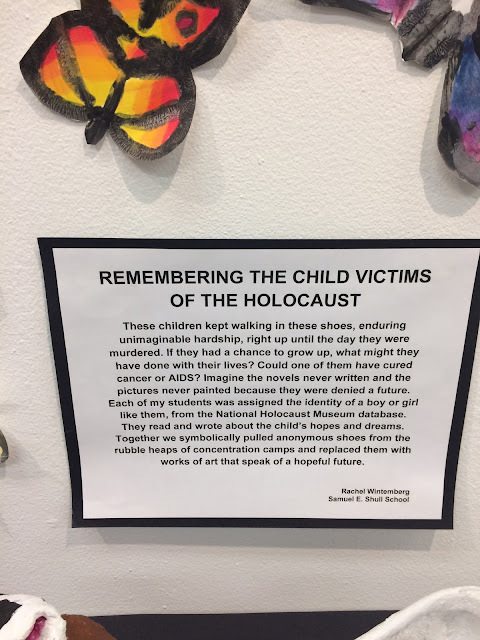 Each child had something to share in the hope that their important message would be heard. Written reflection on lesson implementation and changes to make in the future: If you click on this lesson and scroll down, you will see the many additions and edits I made as the project progressed. As soon as my students ran into a problem, I created a new video or tutorial that they could use to troubleshoot it. 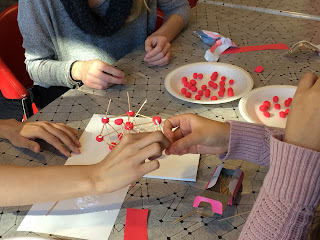 This was necessary since none of us had ever tried this project before. 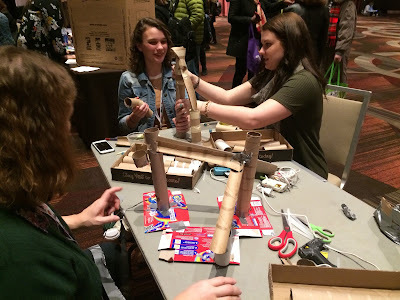 The Rube Goldberg workshop showed me how I could transform my marble run activity into a much more meaningful experience for my students. 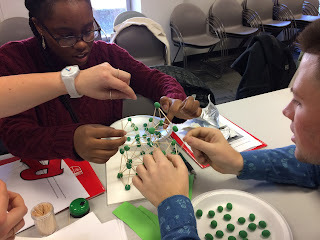 Instead of exploring just one type of energy (kinetic), the lesson could have explored transfers of energy and different types of simple machines. 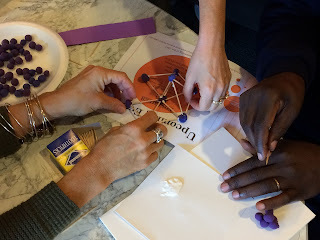 Doing this will strengthen the existing connections this lesson has to the next generation science standards. 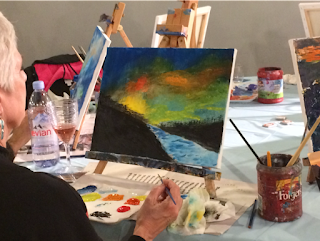 I had always wanted to try doing this but, prior to this workshop, the task seemed overwhelming. 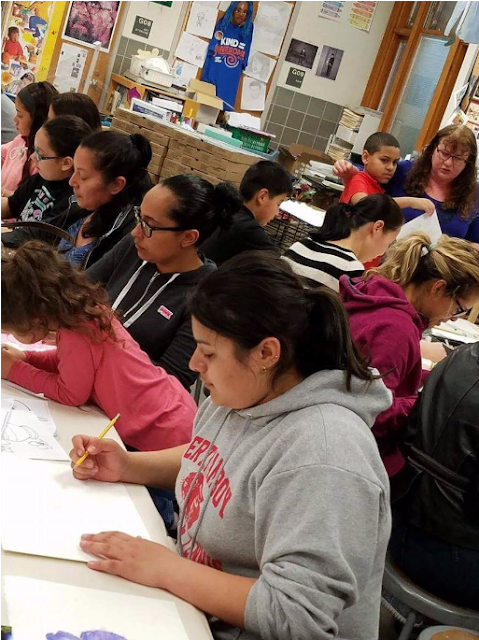 I am now committed to trying Rube Goldberg cause and effect machines with my student and will be presenting a hands on workshop at the Art Educators of New Jersey conference in the fall to share this lesson with other art educators throughout the state. Click here to see the original marble run lesson, which I wrote about in the Summer, 2016 issue of School Arts Magazine, pages 11-12. I am committed to writing a new article School Arts Magazine about how to teach creative problems solving and design thinking by having students invent cause and effect machines, using inexpensive materials,in the classroom. Link to classroom website with accurate, updated, class-related information: Every lesson I teach in my classroom is available on my blog. 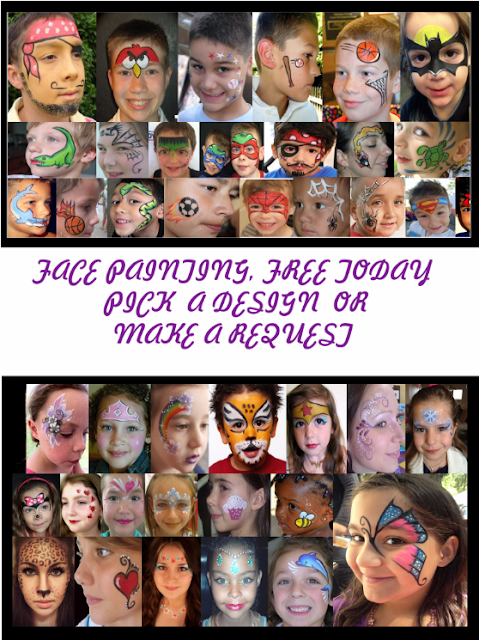 This enables students to work from home and also enables other teachers to duplicate my lessons. The link is posted on my school website for easy access. To view my school website, which includes my classroom rules, please click here. 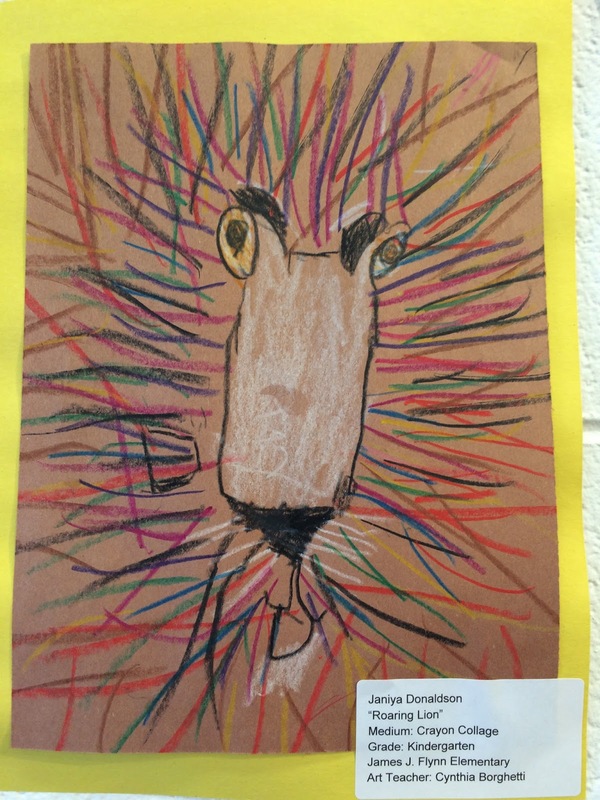 I will present a copy of my parent contact log at my summative assessment. It contains over 80 parent contacts over the course of the school year. 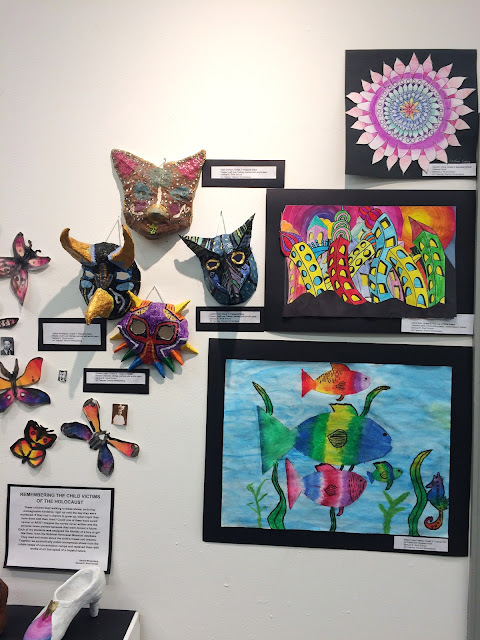 For the most part, these contacts were overwhelmingly positive; inviting students to participate in art shows, asking for permission for students work to be published in magazines and inviting families to special art related events. 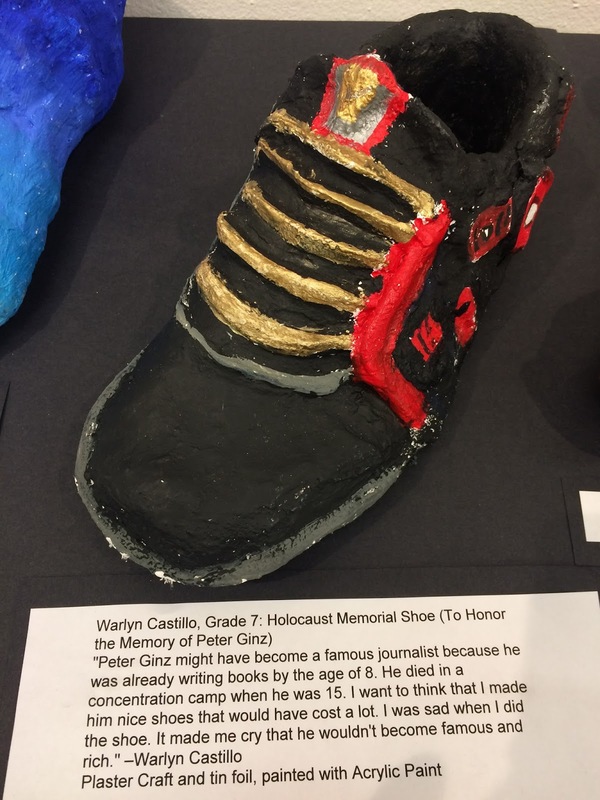 I will bring my parent contact log to my summative assessment conference. 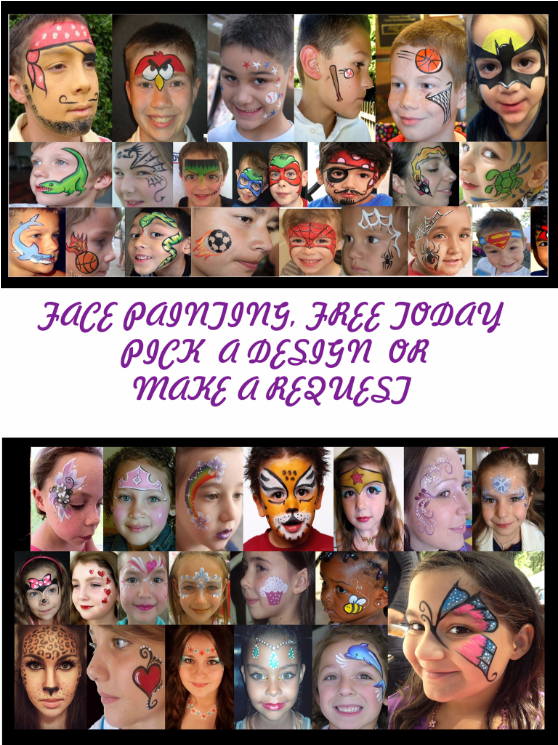 Evidence of appropriate use of social media with parents/families: Please click here to visit my classroom Face Book page. It has 16,000 followers and reaches thousands of people a day from all over the world, informing them not just about what is happening in my classroom but about topics of interest in the art world as well. 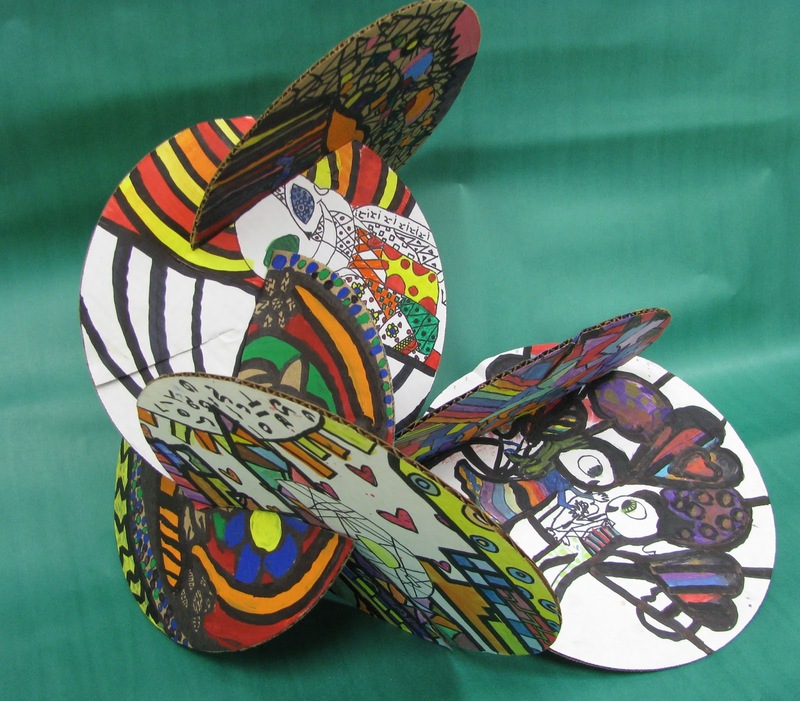 Reflection: This series of workshops focused on the integration of mathematics and visual art. 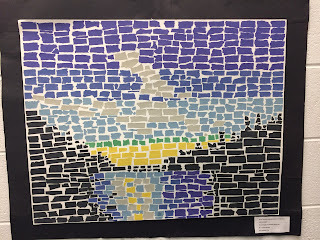 I implemented mathematics vocabulary throughout my art lessons this year and emphasized mathematics skills such as measuring, estimating, proportion, scale and geometry throughout the school year as a result of my participation in these workshops. 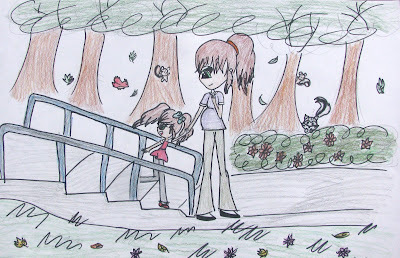 This lesson and this lesson teach proportion, measuring and estimating. This lesson and this lesson teach bilateral and rotational symmetry. 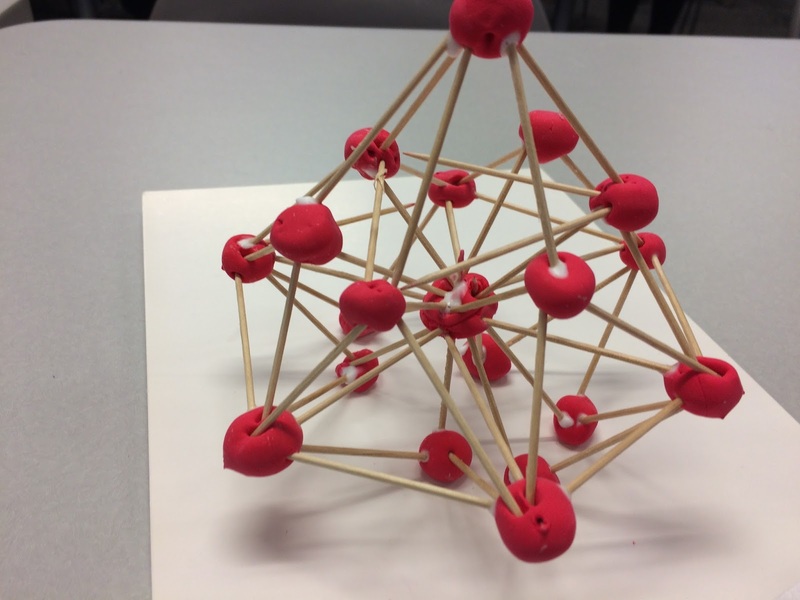 This lesson teaches the meaning and application of multiple vocabulary words used in geometry and is also an exercise in applied geometry. 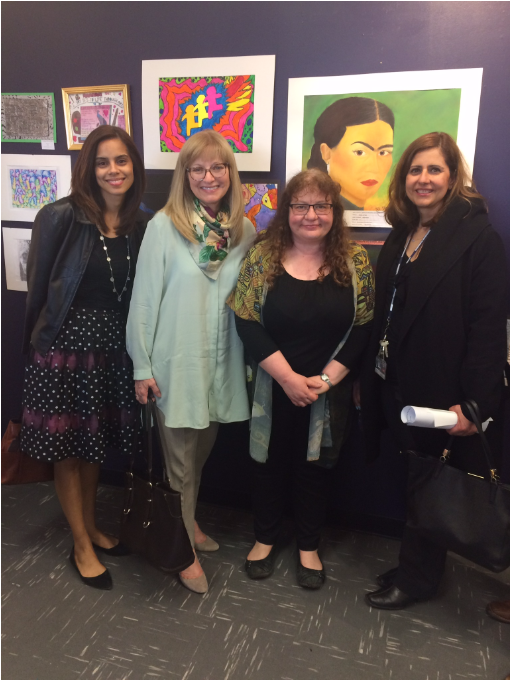 Any type of evidence that shows I advocate for a student or students: You can see that here at the board of education meeting where I spoke. 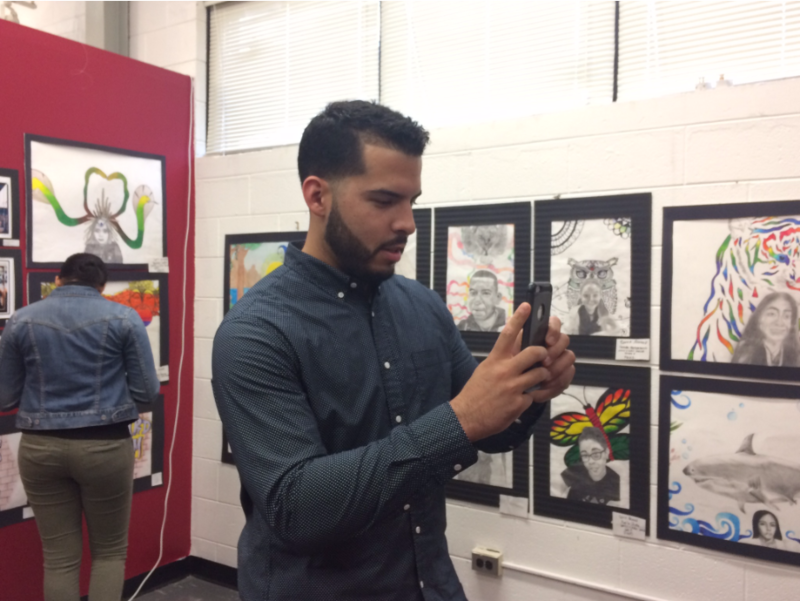 Scroll ahead to me, speaking for one minute and forty seconds (starting six minutes and twenty seconds into this video and ending at the eight minute mark) advocating for our kids. 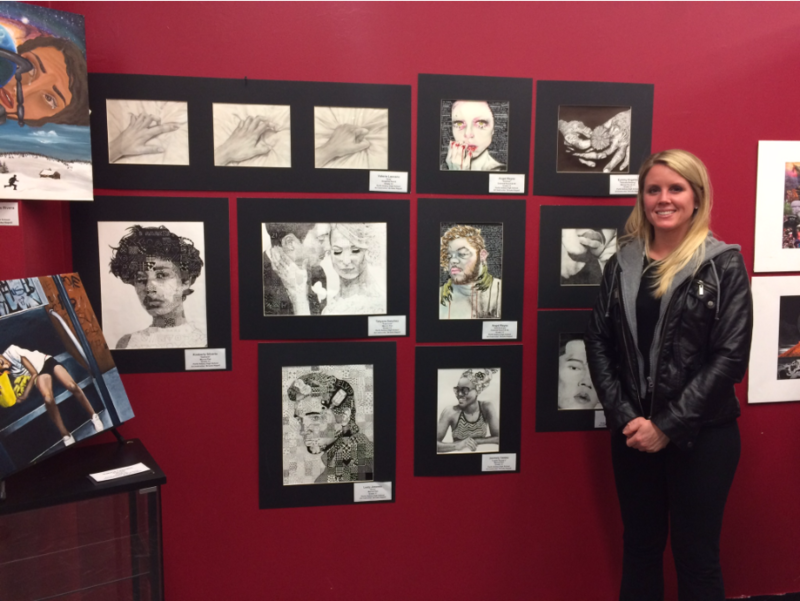 The board approved the art show unanimously. 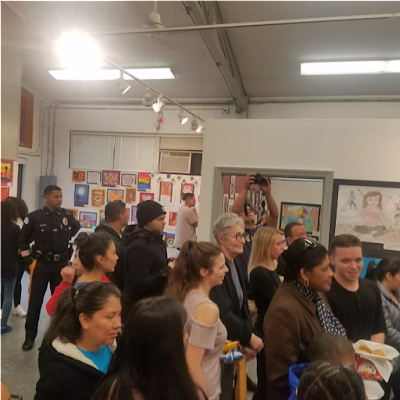 254 students throughout the city participated in this art show. 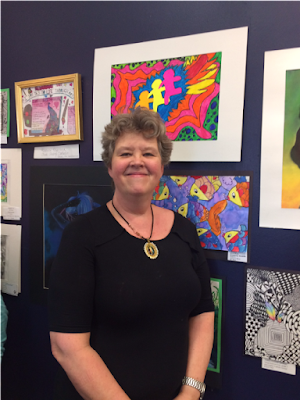 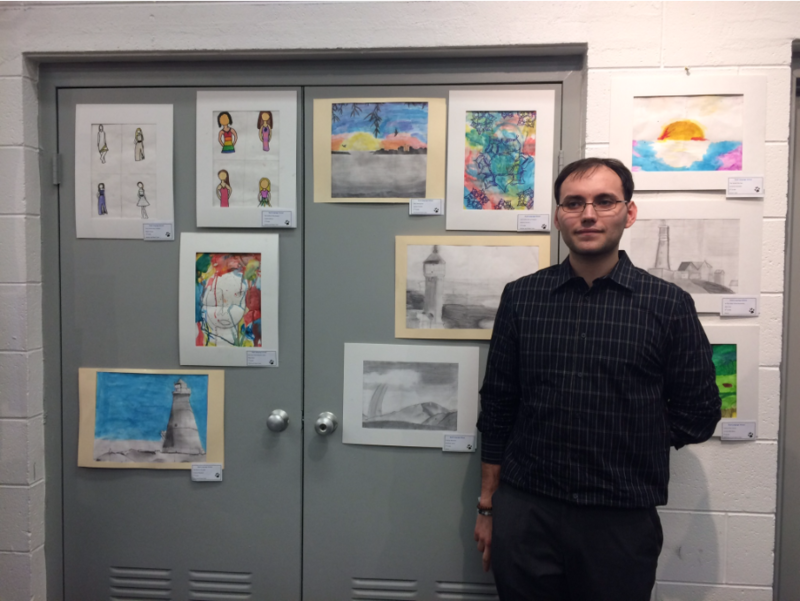 I was not just advocating for my own students, in my own classroom, I was advocating for student artists throughout the city of Perth Amboy. 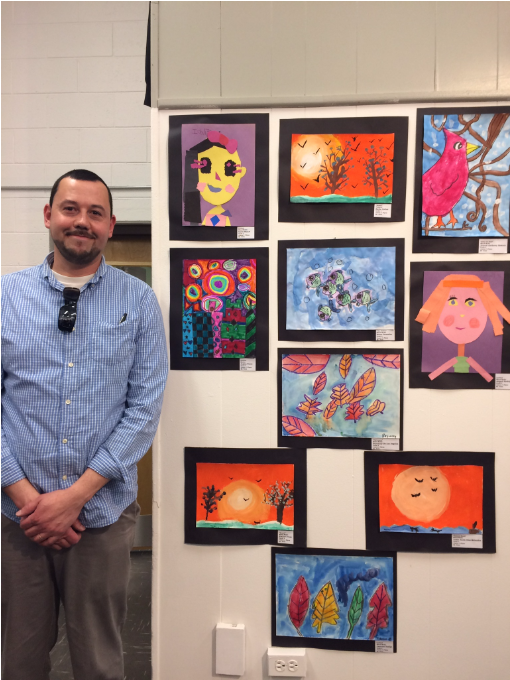 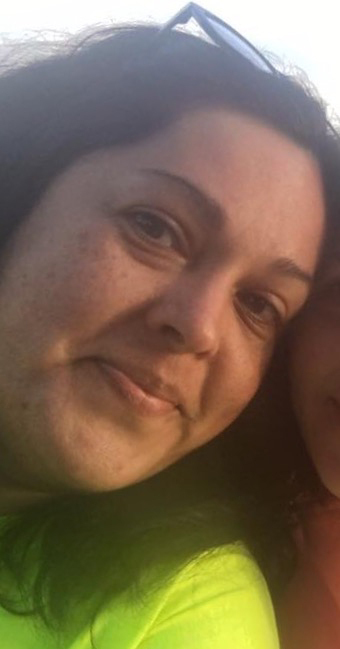 Ways I have provided students with resources 'above and beyond': I have given numerous students the opportunity to be published in a national magazine. 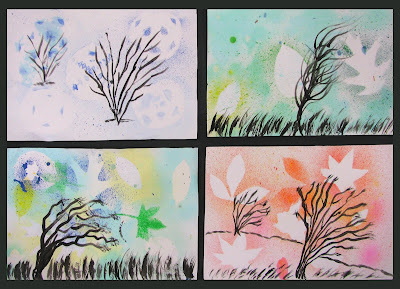 In the summer issue of School Arts Magazine five more students will have their artwork published along with this lesson.